“Bricks are created from clay, water and fire, and with their natural richness of colour and tactile qualities they can imbue a room with a special atmosphere,” writes architect and professor Thomas Bo Jensen in the foreword to Brick Inside, published by Petersen Tegl in May this year. The book’s 230 pages present 59 widely differing interiors that employ many types of bricks and tiles in various ways to create inviting spaces and distinctive elements in rooms. The floor in Alfredo Häberlis exhibition consisted of sections with bricks from Petersen Tegl. The bricks were loosely laid and therefore made sounds by footsteps, encouraging visitors to slow down. The multi-section brick floor comprised the tactile element of the exhibition. Häberli used coal-fired bricks as well as Kolumba, laid both vertically and horizontally. With his exhibition in Cologne in January, Alfredo Häberli focused on the kitchen and its role in the home. Abstract architectural elements in bold shades of green conveyed a simple and direct idiom. The exhibition had a simple, minimalist air. Visitors were encouraged to make the effort to experience the objects in virtual form. With his exciting exhibition, Sense & Sensuality, A kitchen for the near future, at IMM in Cologne in January, Alfredo Häberli focused on the kitchen and its role in the home. Food and cooking have always reflected human culture and civilisation. Overpopulation, climate change, scarcity of resources and many other problems currently facing the planet will increasingly influence our view of food and nutrition. Designer Alfredo Häberli believes that the breadth and depth of these problems mean that we risk losing some of the quality of life associated with food. The exhibition was divided into four layers, the first of which was a floor made of different bricks from Petersen Tegl. The second layer consisted of abstract architecture expressed via simple, bold, green elements. The third, “Everyday Life”, presented familiar objects like tables and chairs, but curated in surprising ways. The fourth and final level required visitors to take an active role. They were asked to use the QR codes dotted around the exhibition to download an app onto their smart devices. After scanning the symbols, their screens displayed a range of new and highly innovative kitchen utensils designed by Häberli. 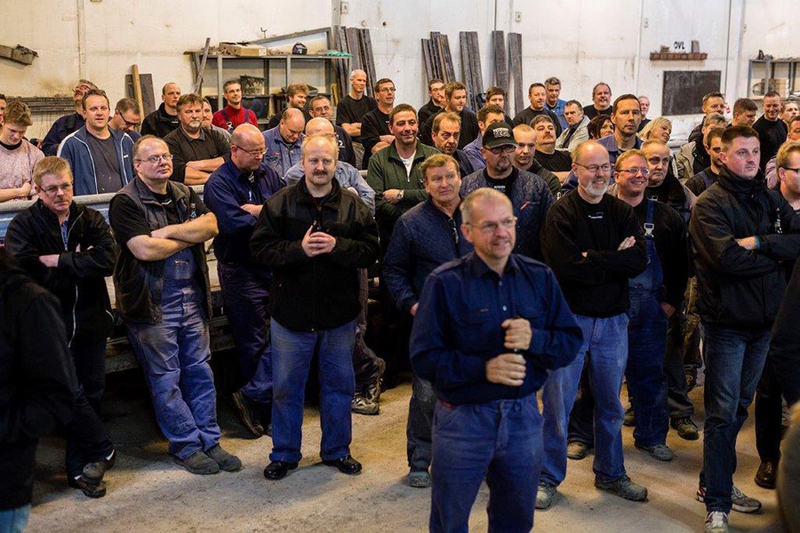 All Petersen Tegl employees participated in the celebrations when Christian A. Petersen received the prize. Klas Sundkvist from Teglakademien presented the award, and a happy Christian A. Petersen thanked him. Between them: grandson Felix Thomsen – eighth generation at the brickworks. Around 140 employees from Petersen Tegl participated in the award ceremony and subsequent lunch. Felix Thomsen and Christian A. Petersen. Right: Klas Sundkvist, Mats Jonsson and Peter Mørck from Tegelakademin. The Swedish ’Tegelakademin’ presented Christian A. Petersen with the award on Monday 10 December with the words ”Christian – you’re the Mozart of bricks”. The award was given to the brickworks owner for his role as ambassador for bricks and for his innovative approach to bricks and other building materials. Klas Sundkvist, the academy’s chairman, said further: ”Today, another award ceremony is taking place, namely the Nobel Prize ceremony in Stockholm. 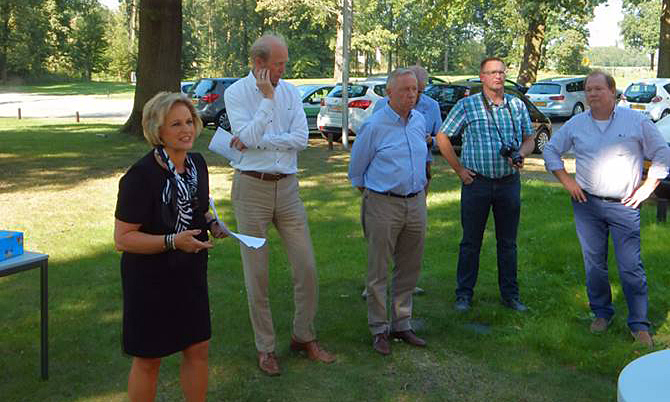 In Broager it’s about the Nobel Prize of bricks!” After speeches and the ceremony, the festive event was celebrated with a joint lunch for all the brickworks’ employees. Petersen Tegl has been present in the Swedish brick market since the early 90s. Since 2013, the marketing has been handled by the company’s subsidiary, Tegelmäster, which is based in Malmo. The new showroom opened in September this year. The full Petersen Tegl range is on display in the new showroom in Bremen. The new showroom has a raw, minimal look that celebrates the warehouse’s original materials. All versions of Petersen Cover are on display in Bremen. It is housed in Speicher 1, a 226-metre-long former warehouse, now a listed building, on Konsul-Smidt-Strasse in Bremen. The city’s landmark brick elephant was erected in 1932 as a monument to German colonialism in Africa. In 1990, it was renamed the Anti-Colonialism Memorial. In September this year, Petersen Tegl opened a new showroom in Bremen, where it shares the 150-m2, high-ceilinged space with GMD Architekten. The whole of the Petersen range is on display in Speicher 1, a historic listed warehouse on Konsul-Smidt-Strasse. The company’s other showrooms in Germany are in Cologne and Hamdorf. Next to the building on the left - seen from the garden - is Nimb Hotel, which is one of Copenhagen's finest hotels. The staggered terraces on the side facing Tivoli Gardens make the new building look less monumental than its 13-metre height. Three iconic buildings - Tivoli Corner from 2017, SAS Hotel from 1960 and Tivoli main entrance from 1890. Tivoli's new Food Hall has outdoor seating. The undulating terraces facing the Gardens provide outdoor areas for guests of the hotel and restaurant on the upper floors. 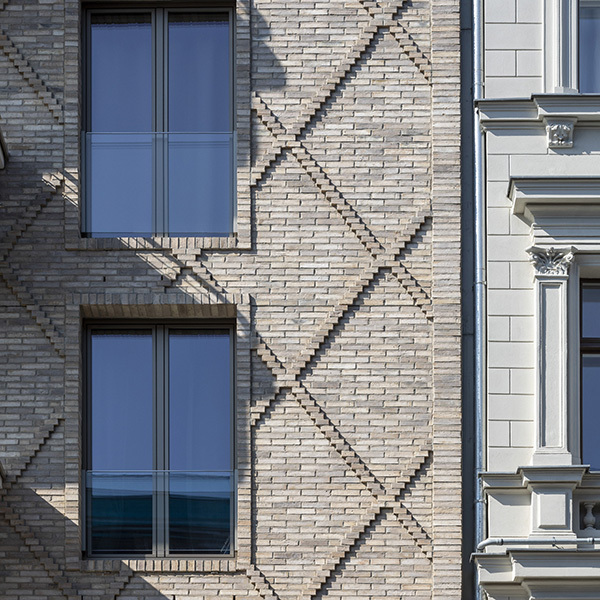 Tivoli Corner’s facade, facing Bernstorffsgade and Vesterbrogade, resembles two glass ribbons. The facade of the garden is made in Petersen Cover in a white-yellow shade, which reflects the colouring of both neighbouring buildings – Nimb Hotel and Tivoli’s main entrance. The Tivoli Corner, designed by Pei Cobb Freed & Partners Architects, has won a 2018 American Architecture Award – one of America’s most prestigious recognitions of new architecture. The American Architecture Awards are described as “the nation’s largest public awards, given by a non-commercial cultural and educational institution without affiliations with the industry”. They are given by The Chicago Athenaeum Museum of Architecture and Design and The European Centre for Architecture, Art, Design and Urban Studies. The Tivoli Corner opened in November 2017 and includes 21 new rooms in the Nimb Hotel, Tivoli Food Hall and several restaurants. The part of the building facing Bernstorffsgade and Vesterbrogade is constructed as two wavy glass bands with incorporated vertical lamellae. 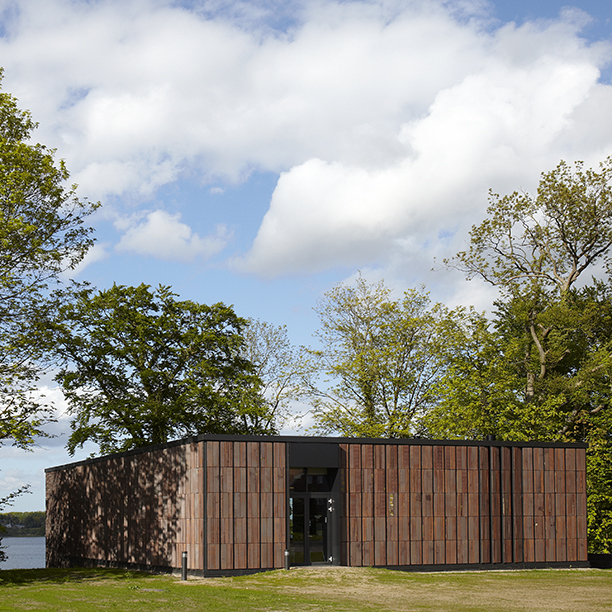 For the part of the building facing the amusement park itself, Pei Cobb Freed & Partners Architects wanted to use Denmark’s natural materials to express the history of the park. Accordingly, the architects took inspiration from Denmark’s long brick-building heritage. 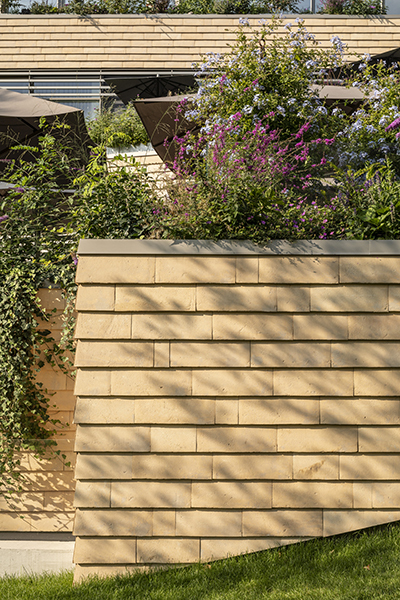 To create the right stone they turned to Petersen Tegl, and in collaboration with Tivoli and the brickworks they developed a special version of Petersen Cover. The yellow shades of the stones match both Nimb Hotel and Tivoli’s main terracotta entrance and thereby form a harmonious element in Tivoli. The Tivoli Corner was recognized for its design, functionality, aesthetics and sustainability in the award category of “mixed-use buildings”. The prize was awarded in June this year. The installation includes life-size sections of the brick cladding for the Z33 extension. Francesca Torzo experimented with multiple colours of clay until she found the right one. The 16th International Architecture Exhibition of La Biennale di Venezia opened 26 May and runs until 25 November. Francesca Torzo’s installation consists of scaled models, life-size sections of brick cladding, samples of materials and texts. The posters of Biennale Architettura can be found all over the city. Most of the water busses in Venice are plastered with the official poster of Biennale Architettura. Torzo’s participation is one of the many responses triggered by the theme and Manifesto of Biennale Architettura 2018, FREESPACE. Petersen Tegl is supporter of Francesca Torzo Architetto’s participation in the 16th International Architecture Exhibition of La Biennale di Venezia FREESPACE, curated by Yvonne Farrell and Shelley McNamara. Francesca Torzo’s exhibition in the Arsenale is one of the many fascinating projects presented at the Biennale this year. When the curators, Yvonne Farrell and Shelley McNamara, invited the Italian architect to exhibit, she quickly made up her mind to concentrate on a single project, her extension to the Z33 House for Contemporary Art in Hasselt in Belgium due for completion in 2019. 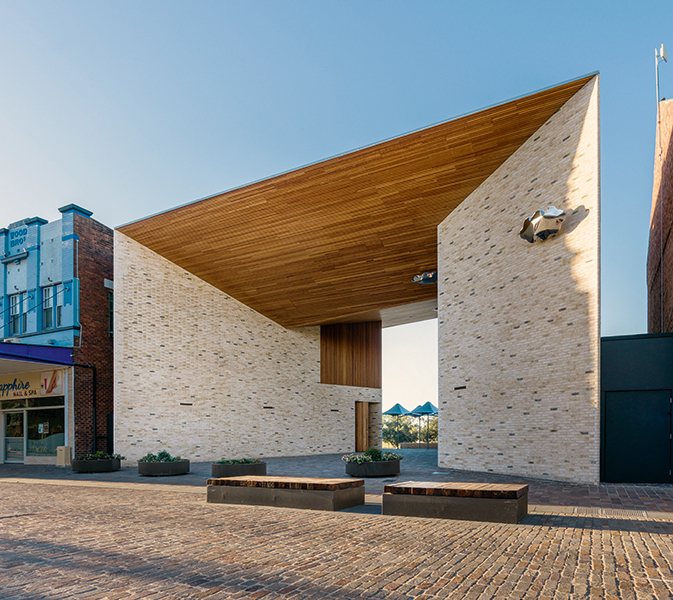 Torzo and Petersen Tegl produced a customised, rhombus-shaped brick for the project. 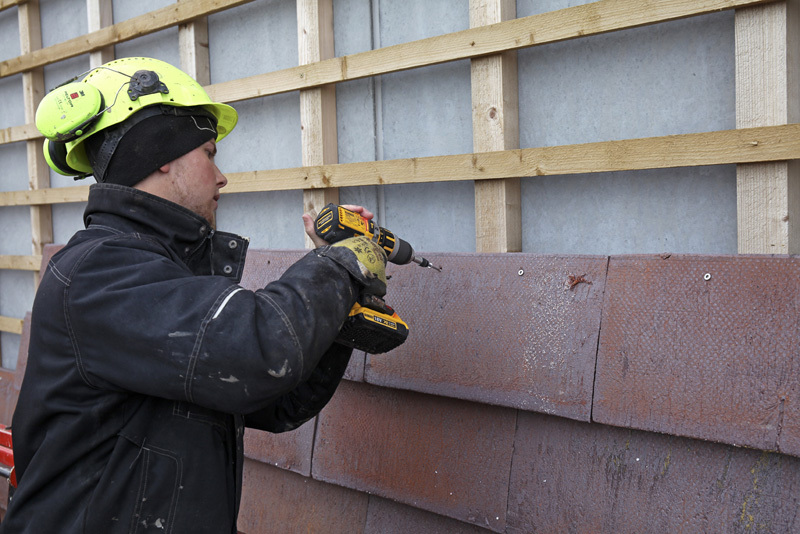 Handmade from a combination of German and Danish clay, it is used to clad exterior walls at Z33. For Biennale Architettura, the architect has opted to exhibit life-size sections of cladding along with models of the building on a 1:5 and 1:10 scale and other items from the project. The result is a wonderfully poetic exhibit in beautiful harmony with its surroundings in the grandeur of the Arsenale. The winners of the 2018 Häuser Awards were revealed in the April/May issue of Häuser magazine. The impressive jury consisting of Thomas Penningh, President of VPB, Anne Zuber, editor-in-chief of Häuser, Heiner Farwick, President of BDA, Jórunn Ragnarsdottir, architect at LRO Lederer Ragnarsdóttir Oei, and Reiner Nagel, CEO of Bundesstiftung Baukultur. Silja and Malte Timm did not even expect to be in the top 30 of the competition. So they were overwhelmed when they received the call saying they had had won first prize. According to the jury, the house’s level changes and large windows make it seem large and spacious. The architects, Silja and Malte Timm, say the clients love the bricks because of their variety of formats and sustainability. 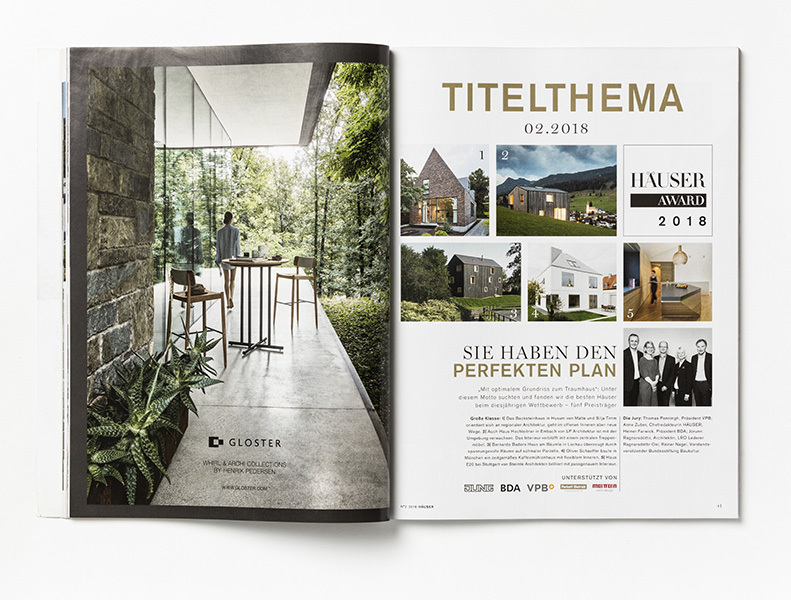 “The perfect plan – an optimal ground plan for the dream house” was this year’s motto for Häuser magazine’s competition. The furniture chosen by the architects include Ystolen, the iconic Danish chair produced by Carl Hansen & Søn. A total of five houses were given awards. 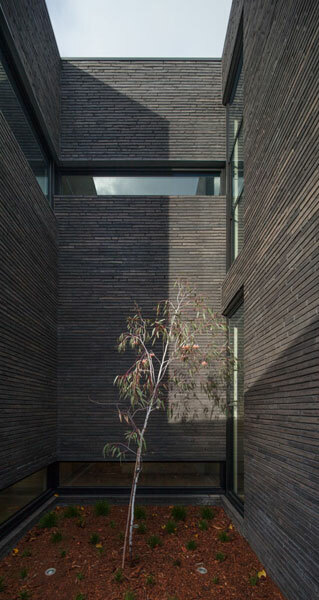 The second prize went to a wooden house outside Salzburg in Austria. A house in Lochau in Austria came in third. 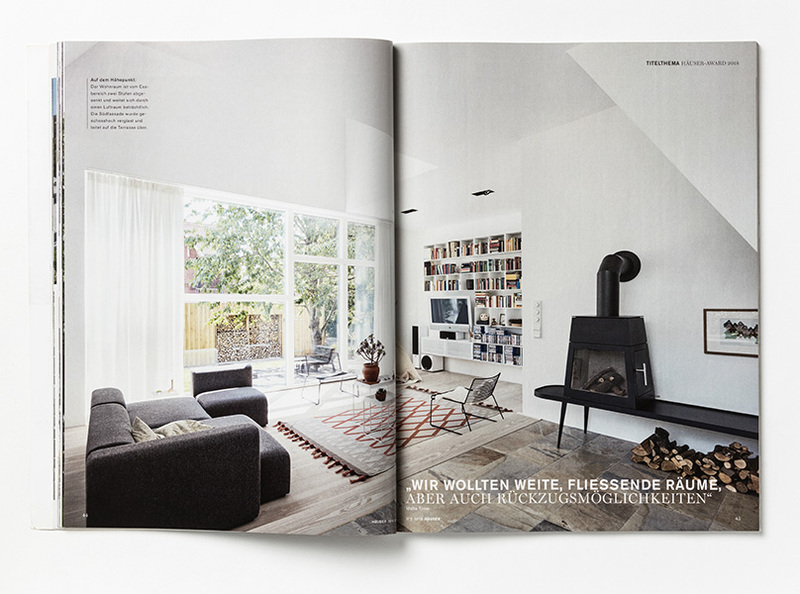 The first prize in Häuser magazine’s competition to find Europe’s most beautiful single-family home was awarded to a house in Schleswig-Holstein made of bricks from Petersen Tegl. 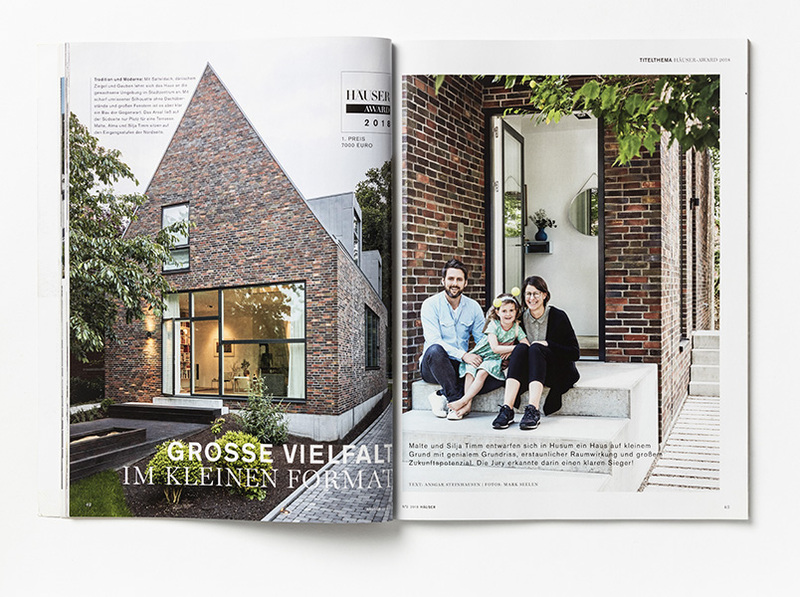 These were the words of the jury when the results of the 2018 ‘Häuser Awards’ for Europe’s best single-family houses were published in the April/May issue of Häuser magazine. The first prize went to a house the architects Malte and Silja Timm designed for themselves in Husum, Schleswig-Holstein. The jury highlighted the house’s authentic materials and excellent layout, which get the very best out of 150 m2 in a plot of just 466 m2. 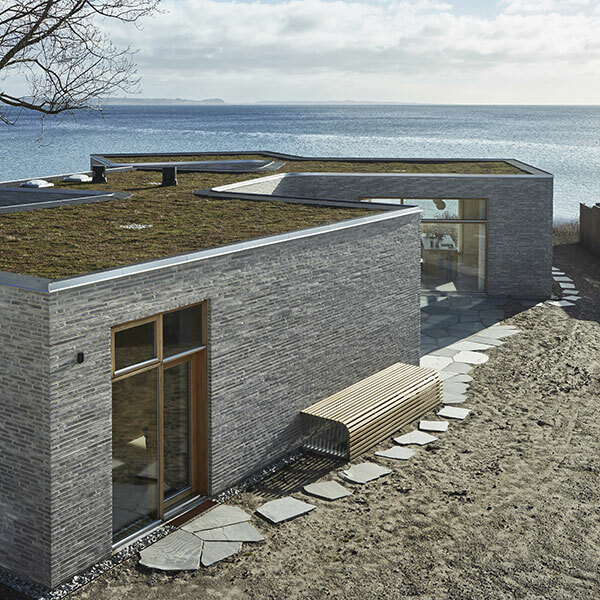 Malte and Silja Timm have great respect for Danish building culture and chose D48 for their dream home. Their veneration and knowledge of Danish materials and design stems from living in Denmark for a number of years, during which they worked as architects for the Danish architect Dorte Mandrup. 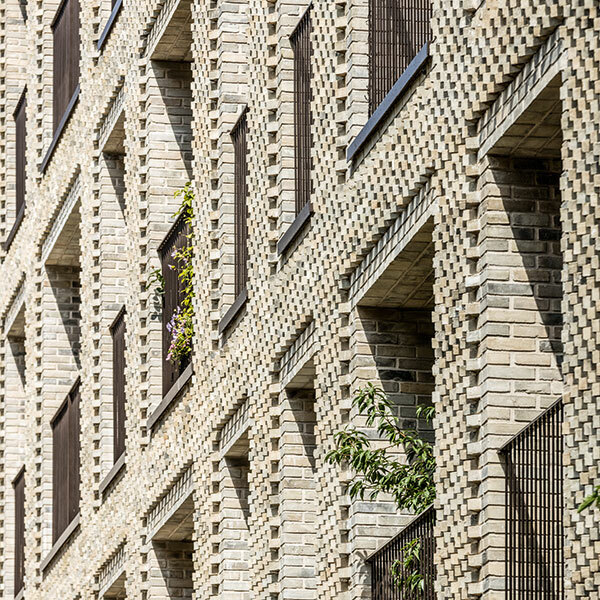 Wienerberger Brick Award 2018: Petersen Tegl has supplied bricks for six of the 50 nominated projects. The Carlsberg Foundation Researcher Apartments, Frederiksberg by Praksis Arkitekter. Brick: Custom-made D190, developed by Praksis Arkitekter. Kannikegården, Parish Hall, Ribe, by Lundgaard & Tranberg. Brick: C48, dimensions 630 x 350 x 55 mm, customised version designed by Lundgaard & Tranberg. Villa in Aarhus, designed by Adept Arkitekter. Brick: K91 including custom bricks at corners. The European Hansemuseum, Lübeck, by Studio Andreas Heller Architects & Designers. Brick: Custom-made brick, English clay, produced in three versions with varied concentrations of the clay slurry on the surfaces. Kunstmuseum Basel, Christ & Gantenbein. Brick: D91 and specially moulded D11. 50 nominations – from an initial pool of 600 submitted by 44 countries – are competing for the five categories in the renowned international Wienerberger Brick Award 2018. The eighth Wienerberger Brick Award will go to buildings that stand out as examples of modern and innovative brick architecture. The winners will be announced at the big official Brick Award Show in Vienna in May. by Studio Andreas Heller Architects & Designers. by Hermansson Hiller Lundberg Arkitekter. Happy award recipients: Peter Thostrup, client representative and Head of Secretariat of the Carlsberg Foundation, and Mads Bjørn, architect, with Mette Tony, founder of Praksis Architects. The award-winning Researcher Apartments are a distinctive building carcass with an exceptionally high level of detail. With its loggia and recessed top storey, the former soft drinks factory from 1927, designed by Carl Harild, has clearly influenced the design of the researcher apartments. The play of light and shadow on the brickwork changes with the sun’s path across the sky. The flower meadow on Amager received a special Beautification Award. 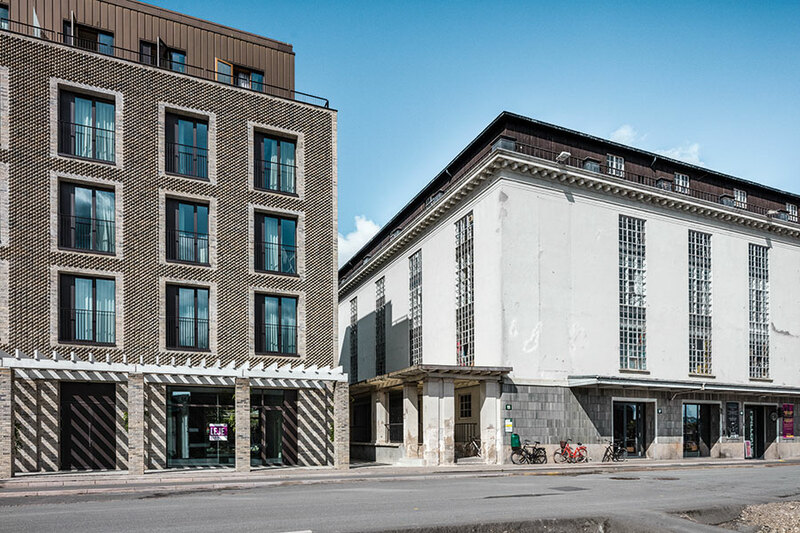 The new building in the Carlsberg Quarter in Copenhagen, designed by Praksis Architects, were among the recipients of the awards made by 'the Association for the Beautification of the Capital' on 6 December. The association was founded in 1885, and since then, its aim has been to "promote the beautification of the capital city”. This year’s ceremony took place in ‘Bygningskulturens Hus in Copenhagen. 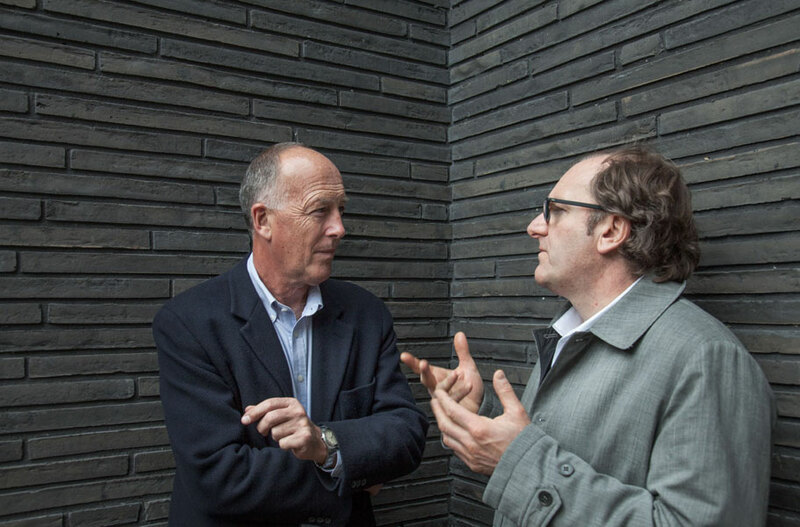 The architect Mads Bjørn and the Head of Secretariat at the Carlsberg Foundation Peter Thostrup representing the client, expressed their gratitude for this well-earned award. The researcher apartments, mentioned in the latest edition of Petersen magazine, are exceptionally well-integrated in the historical Carlsberg area. The building is a contemporary curtain-wall building, but with brick façades in a pattern of slanting bricks, a so-called sawtooth bond. This gives the building the gravitational effect of a historical, all-brick building, and the result is extremely beautiful. The brick used is a specially-developed light brick from Petersen Tegl. The other projects that received awards were the Mærsk Tower, designed by C.F. Møller Architects, Axel Towers, designed by Lundgaard & Tranberg Architects, and The Silo, designed by COBE. The flower meadow on Amager, established by the City of Copenhagen, received a special Beautification Award. The museum’s perforated brickwork provides natural ventilation and a beautiful play of light and shade. The light, grey brick was originally the result of a firing error but Zumthor thought it was just right. The brick – named after the museum – was ideal because its 40-mm height made it easy to fit in with the ruins’ complex and detailed surfaces and shapes. Lundgaard & Tranberg refined Kolumba in a new shade and adjusted the format for The Playhouse in Copenhagen, which opened in 2008. Petersen Tegl imported English and German clay to bring out the colour Lundgaard & Tranberg wanted in their version of the Kolumba for the Playhouse. The Kolumba range now includes 28 different colours. Not many bricks celebrate an actual birthday. Then again, not many bricks were brought into the world by an internationally renowned architect. The brick in question is, of course, Kolumba – which first saw the light of day a decade ago, when the Kolumba Museum opened in September 2007. Peter Zumthor wanted a special type of brick in a Roman format for the museum, which integrates the chapel Madonna in den Trümmern, Roman ruins from the 1st century CE, and church foundations from 9th and 13th centuries. 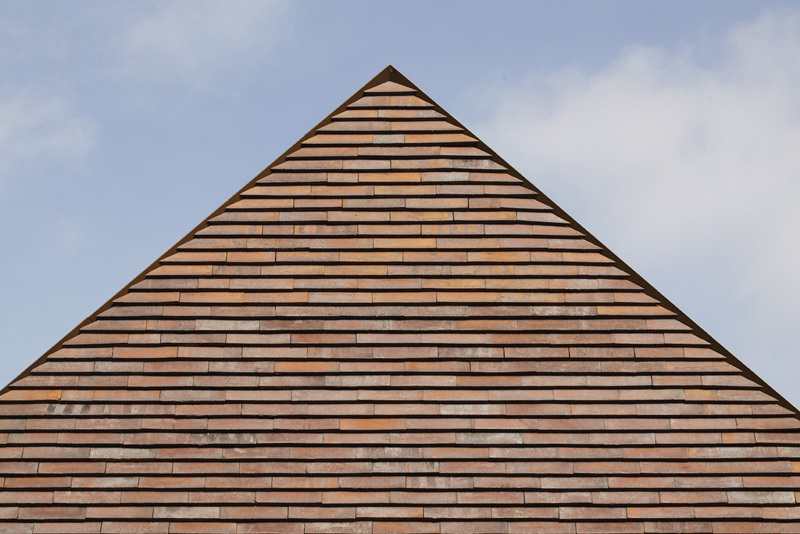 The brickworks in Broager submitted a proposal and, after months of experiments with colours and firing, the delicate, pale-grey brick was approved. 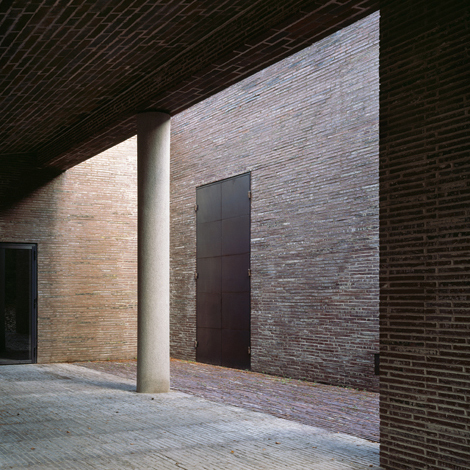 Before the museum was completed, the Danish architects, Lundgaard & Tranberg, refined the brick product. The result was a hard-fired Kolumba in dark, earthy colours for the Royal Danish Playhouse in Copenhagen. The Kolumba range now includes 28 different colours and is sold in 43 countries on five continents. 40,000 scouts participates in in the Scout & Guide Jamboree in Sønderjylland. 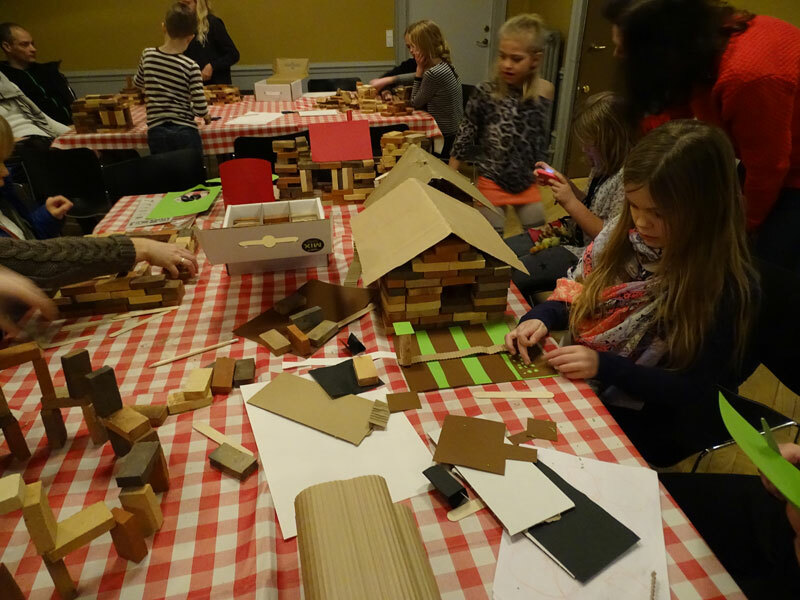 Egernsund and Petersen Tegl have joined forces to create the activity, "The Brickworks." The two brickworks have supplied the bricks for engraving. Concentrated work while engraving the bricks. “The Brickworks“ is a popular activity at the camp. On banners you can read about how to make bricks and the history of bricks. “The Brickworks“ is placed in a big, white tent. “The Boot,“ the landmark of the Jamboree, where the bricks will be laid as a floor. 40,000 scouts from all over the world have the opportunity to work with bricks right now. 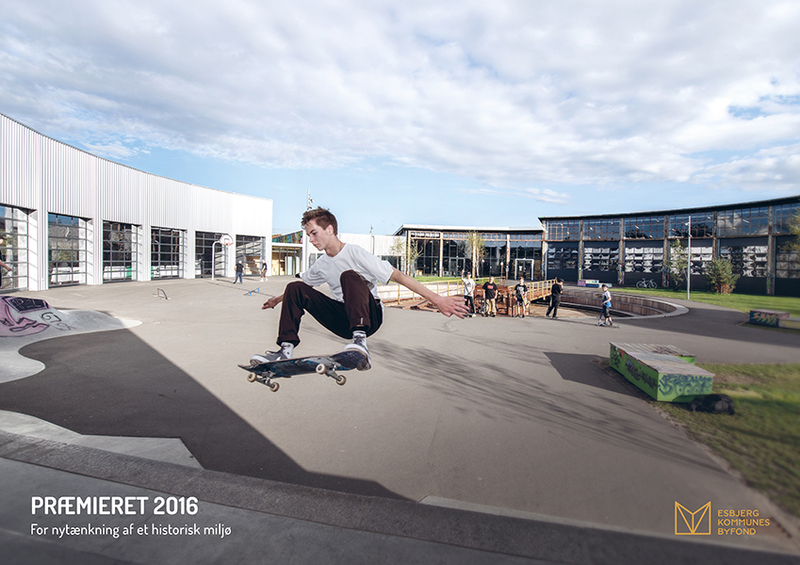 It is happening 22-20 July in the Scout & Guide Jamboree in Sønderjylland – so far the biggest jamboree in Denmark. 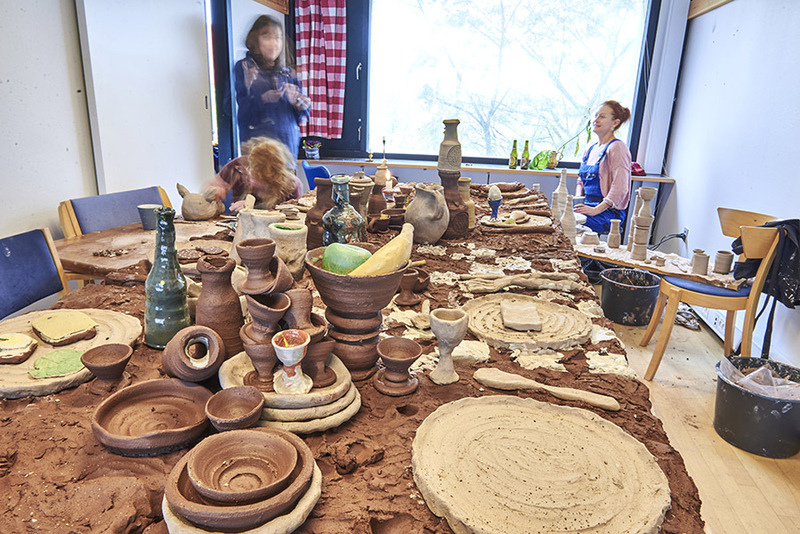 Fired clay is of huge significance in Southern Jutland. Two brickworks in the region, Petersen Tegl and Egernsund Tegl, have therefore joined forces to put on a special organised activity ,‘’The Brickworks’’, for the scouts who are between the 10-17 years old. Every day throughout the Jamboree, scouts, guides and visitors can engrave their names or drawings into bricks. The activity is happening in a big , white tent.. Inside the tent are placed long banners featuring photos, drawings and text about the history of brick and information about the production of brick. After the Jamboree, the finished bricks will become part of a permanent monument called “The Boot” – a 20-metre high building shaped like a boot and with a thatched roof. The bricks will pave the floor of this future visitor attraction. In years to come, scouts and guides who attend Jamboree 2017 will be able to visit their own personal bricks – they will have left a lasting impression! Annette Petersen, Petersen Tegl, Laurant Rueff, the Swiss embassy and Thomas Graversen of Fredericia Furniture, who is also a member of the Pavilion Society, attended the Danish Design Awards in Industriens Hus on 8 May this year. Mads Quistgaard from Urgent.Agency, Frida Wechsler, Ambassador Benedikt Wechsler, Annette Petersen and Peter Zinck. The pavilion at the Swiss embassy, designed by Ladner Meir Architechten, provides the setting for the embassy’s many activities. Taking so-called pop-up embassies out into town is one of several unconventional initiatives launched by Benedikt Wechsler since he took up his post as the Swiss ambassador to Denmark in 2015. “The pop-up embassy represents a completely new way of creating embassies, as well as an attempt to foster a cultural change whereby diplomacy moves out to the people instead of hiding in guarded domiciles. The project is a piece of social design in keeping with contemporary demands for transparency, and can be perceived as part of a larger movement away from elitism, exclusiveness and bureaucracy. The idea is innovative and bold, and can serve as an inspiration for other public bodies and authorities that want to get closer to their users and citizens.” The pop-up embassy was developed in cooperation with Urgent.Agency and was nominated in the category Message Received, Game Changer. Among the embassy’s other creative activities to promote cultural and commercial relationships are “Architecture in Residence” and the “Pavillion Society”, whose members – including Petersen Tegl – work with the embassy on projects with other businesses, universities and schools. The new Flos showroom is situated in Sydhavnsgade 28, Copenhagen SV. The 500-m2 new showroom was formerly occupied by a tractor-repair workshop. A small house clad in Cover exhibits interior, domestic lighting. 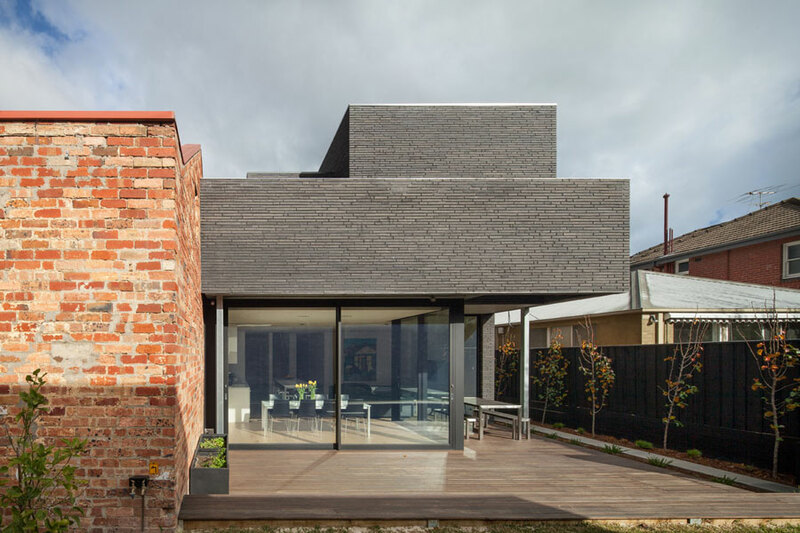 The gray shades in the Cover brick fit nicely to the room's original concrete structure. 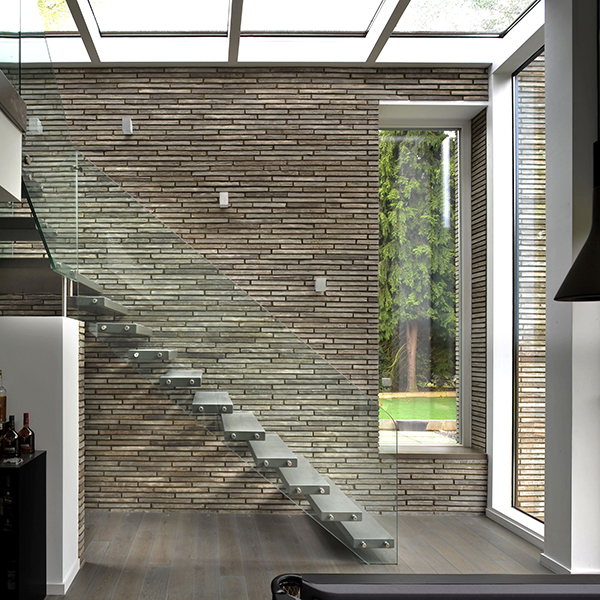 Among the new elements is a dramatic, sculptural staircase. In early spring this year, designer lighting retailers Flos Scandinavia opened the doors to their new showroom in Sydhavnen, Copenhagen. The 500-m2 former tractor-repair workshop has been transformed into a highly inspiring exhibition space of international calibre. Behind the transformation is the multidisciplinary design firm OEO Studio, founded and headed by Thomas Lykke and Anne-Marie Bueman. The renovation project preserved several of the large rooms’ original spatial and material features, and combined them with a new display system and new architectural elements. The result is a beautiful and inspiring whole that functions extremely well as a setting for the Flos lighting range. Among the new elements is a dramatic, sculptural staircase that acts both as a room divider and display stand for table lamps. Another element is a small house that showcases domestic lighting. Clad in Cover in shades of grey, the house interacts in a highly convincing manner with the raw concrete character of the space. 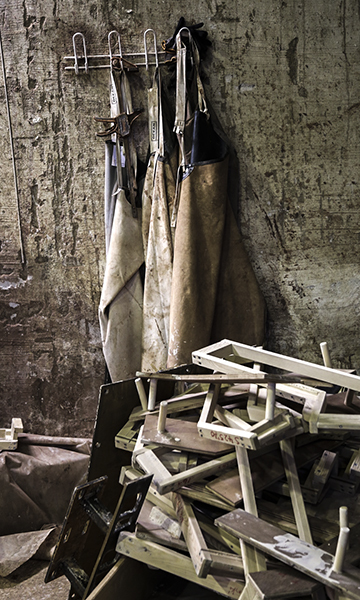 Atmospheric images from the Kolumba production facility. The Danish daily broadsheets Politiken, Boersen, Berlingske Tidende and Jyllands-Posten all carried a full-page ad in January featuring two members of the production staff at Petersen Tegl and the words 75,000 – THANKS. The campaign was launched by the Danish Export Credit Agency, which has been generating growth and creating jobs in Denmark since 1922. In 2015, the Agency helped Petersen Tegl fund a new brickworks to help meet demand for Kolumba. The company was delighted to receive this support - much like the other 800 companies the Agency has helped in the last five years alone to land orders worth more than DKK 125 billion and keep some 75,000 jobs in Denmark. The campaign was designed by the marketing agency Fireball. Møllebro & Dreyer took the photo for the ad, as well as a range of evocative images on display below alongside the ad. 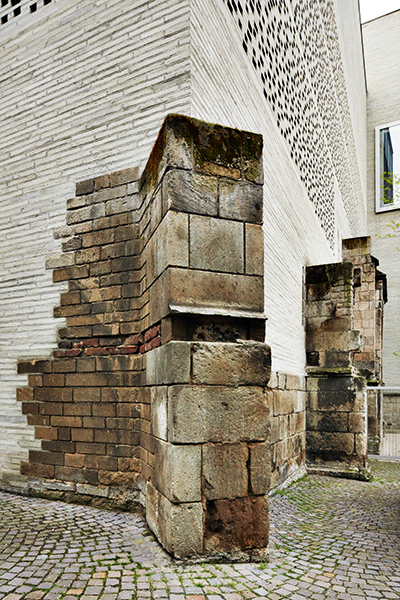 A crack in the body of the building marks the entrance to Kunstmuseum Basel. 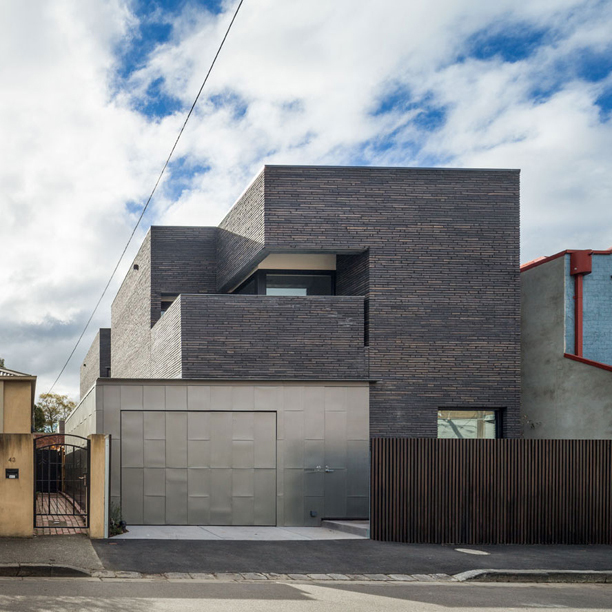 The bricks alternate between dark and light grey, and break the look of the building up into horizontal bands. LED lights are used to project text onto one of the bands. Petersen Tegl produced customised bricks with a concave mould so lights could be placed flush with the façade. The staircase, clad in Carrara marble, winds dramatically up through the building. Every other brick course protrudes slightly to produce the subtle relief effect on the façade. In early December, Oliver Wainwright, The Guardian’s architecture critic, announced his top ten most interesting buildings completed in 2016. 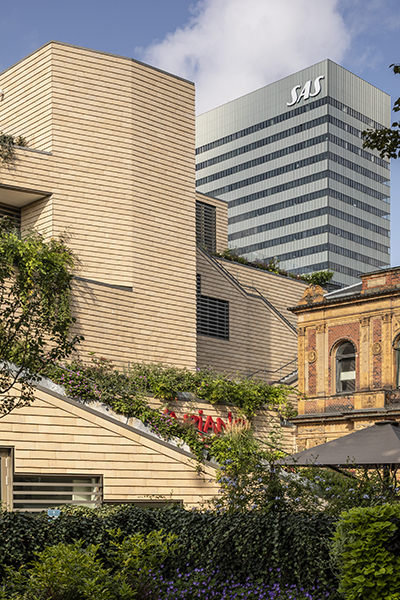 At number four is Kunstmuseum Basel, designed by Christ & Gantenbein, for which Petersen Tegl supplied two types of brick in different shades of grey. The list also includes Tate Modern Switch House in London and Hamburg Elbphilharmonie, both designed by Herzog & de Meuron, 432 Park Avenue, New York, designed by Rafael Vinoly and the Palestinian Museum, Birzeit, by Heneghan Peng. Tegelmäster’s new meeting room has plenty of daylight and is furnished with Danish classics, e.g. the Wishbone chair designed by Hans J. Wegner and the PH 5 pendant designed by Poul Henningsen. The company’s large assortment of bricks is displayed on black racks in the large meeting room. Guests enjoyed an organic lunch prepared by Nordic Street Food. Many of Tegelmäster’s business partners came to see the new building on 12 October. 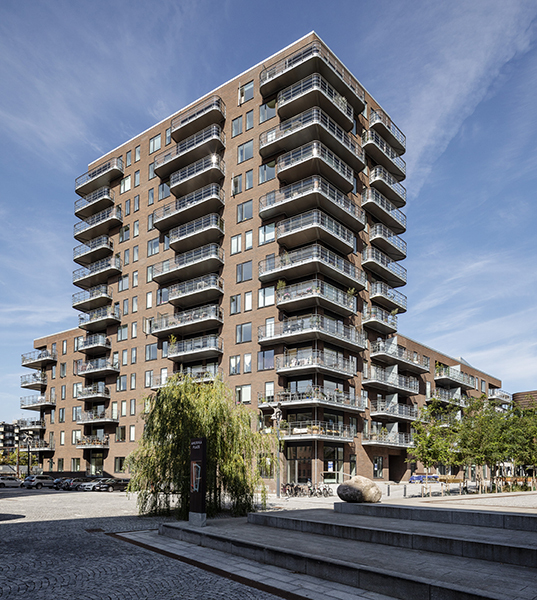 The effects of the growing number of impressive, brick buildings in Sweden have been felt by Tegelmäster, the market leading consultant and supplier of brick, lintels, sliding layers and consoles. A combination of the wide product range of bricks due to joint ownership by Egernsund and Petersen Tegl and the continuous growth the company has enjoyed since it was founded in 1999 meant that Tegelmäster was gradually running out of room at its premises in Bara. As a result, the 23 staff, including its eight-strong sales team, has moved to new headquarters – a 750 m2 building on Olsgårdsgatan 15 in Malmö. The new HQ opened on 12 October, when partners and friends were invited to a celebratory lunch. Tegelmäster looks forward to seeing them all again next summer for a major outdoor exhibition of sample walls. The X shaped building, is located in the center of Lodz surrounded by a small park. Photo: Piotr Piątek. Ericpol’s building is clad with Kolumba in light shades of gray. Photo: Piotr Piątek. Ericpols building is one of the first in Poland to use Kolumba. Photo: Piotr Piątek. The large partitions of glass allow the 800 employees to enjoy the surrounding park. Photo: Piotr Piątek. The walls in corridors and offices represent eminent persons of science, culture and sport. Photo: Piotr Piątek. Petersen Tegl supplies bricks for 40 countries worldwide, and the market is constantly expanding. Poland, where Petersen cooperate with Centrum Klinkieru Schütz, is one of the newer markets in growth. One of the latest buildings in Poland built with Petersen bricks, is commisioned by the company Ericpol in Lodz in the middle of Poland. The building contains Ericpol’s software development and employs 800 people. Horizone Studio designed the building which was inaugurated in 2015. The new building, located in a beautiful small park with large trees, is formed in a modern design and comprises 12,000 square meters. The building is formed as two wings that make up an X connected with a glass lobby. It was crucial for the builder and architect that the building exudes quality, that all materials have a long life and will age beautifully. As we know, masonry meets the demand for long life, and the decision was made to clad the building with a light, gray Kolumba. The four gables, terminating the opposite ends of the X, use large horizontal windows. The facades in the longitudinal direction are performed as glass panels in a rhythmic modulation. The area around the house is covered with granite stones. This year Ericpol’s building received the prestigious 'SARP Award', given to the best architectural building in Poland. The award is given by 'the Association of Polish Architects (SARP). The pavilion, designed by Ladner Meir Architecten, is part of the Swiss Embassy. The embassy, located on Richelieus allé in Hellerup, had more than 600 guests during the 3 days, there was an open house. There was the opportunity to listen to a series of design talks during the design days. The pavillon can be opened to allow direct contact with the large garden. The new section of Kunstmuseum Basel is located vis-a-vis the original museum. Kunstmuseum Basel is designed by Christ & Gantenbein and made of coal-fired bricks from Petersen in different sizes and shades of gray. During 3daysofdesign the Kunstmuseum Basel was exhibited with photos and text in the Swiss embassy pavilion. The embassy now offers the best of Swiss designed or manufactured furniture design. In late May Copenhagen once again formed the setting for 3daysofdesign where companies and organizations in the industry welcome you. This year, Petersen Tegl – in cooperation with the Swiss Embassy – was part of the popular event. Since the highly dynamic Ambassador Benedikt Wechsler came to Denmark last year, he has attached new strong contacts between Denmark and Switzerland, not least in the field of design and architecture. On the occasion of 3daysofdesign Wechsler had asked designer Alfredo Häberli refurbish the embassy, ​​which is also the home of the Wechsler family, so the house now only offers the best of Swiss designed or manufactured furniture design. The 600 guests who visited the embassy during the three days, also had the opportunity to inform themselves about the latest that has happened on the Swiss architecture scene. In text and images one could experience the extension to the Kunstmuseum Basel, inaugurated in April. The building was designed by Christ & Gantenbein, who chose coal-fired bricks from Petersen Tegl to the building's facades. The Kunstmuseum Basel exhibition was located in a pavilion that is a result of another collaboration between the two countries. The pavilion is designed by the Swiss architects Ladner Meier, who have offices in both Zurich and Copenhagen – and who incidentally also have used Petersen bricks for projects in both Denmark and Switzerland. The two buildings are located on a hilly site with large pine trees. The architects R21 chose the coal-fired D96 in dark grey shades combined with C96 in similar colours. The project consists of two square blocks situated on Furulundsveien in Ullern. The two new apartment buildings have flat roofs so that the fine views from the residences are the best possible. 21 April the Masonry Prize 2016 was given to R21 architects. On April 21 the prestigious Norwegian Masonry Award was given to a housing project, designed by architects R21, about 8 km west of Oslo. The award which is given by Norsk Murforum / Byggutengrenser in cooperation with Norwegian architects’ national federation aims to stimulate and develop the use of good masonry in Norwegian buildings. This year's winning project consists of two square blocks situated on Furulundsveien in Ullern located near a timber house from 1962 on a hilly site with large, old pine trees. The architects chose brick to create a clear distinction between the new buildings and the existing villa. The masonry is made of D96 in different bonds and reliefs to create a play of shadows and in order to break down the buildings’ volumes. The balconies are clad with C96, which emphasizes them as lighter elements. "This year the jury received a record number of proposals for the Masonry Award. Eventually we chose the housing project on Furulundsveien, which is distinguished by outstanding architecture, superb craftsmanship, and clever adaptation to the environment," said jury leader, Ole H. Krokstrand in his speech at the award ceremony. Petersen Tegl A/S received the Danish Industry Initiative Price HRH from Prince Joachim. CFO Poul Kjeldsen and CEO Jørn Enderlein, Petersen Tegl next to the artwork, which along with the honor represents DI's Initiative Award 2016. The sculpture is created by the artist Jens Ingvard Hansen. HRH Prince Joachim and Christian A. Petersen. Prior to the award ceremony in the House of Industry, DI's CEO Karsten Dybvad (left) debated with Tax Minister, Karsten Lauritzen in a socalled 'Politician Speed Meeting." A happy family! - Christian A. Petersen with his two daughters - Vibeke Thomsen left and Annette Petersen right. Then HRH Prince Joachim, DI's chairman Lars Mikkelgaard-Jensen and DI's CEO Karsten Dybvad. On 20 January, Petersen Tegl was given a coveted recognition, namely DI's Initiative Award, presented by HRH Prince Joachim at Danish Industry's annual conference for small and medium sized enterprises in the House of Industry in Copenhagen. A total of 19 companies, all of which have received DI's regional initiative Prizes in 2015, were nominated for the award. "This year's winner has managed to bring several hundred years of experience, knowledge and craftsmanship within our era. The company distinguishes itself through a unique ability to see opportunities and put words into action. It makes things a little better and different than others, and also it has the courage to try new things," said HRH Prince Joachim, among other things, before he revealed the winner. DI's CEO Karsten Dybvad motivated the choice of laureate with these words: "Petersen Tegl has unique products and is ready to develop and experiment to meet customer needs. Therefore, the company is able to sell bricks at far higher prices than the competitors. The brickyard has found its own niche and is a frisky business despite its over 200 years." The Turnmill building is made with soft curves like its predecessor on the site. The building is situated in the busy Turnmill Street close to Farringdon Station. The neighboring Session House is built in light sandstone. Together with Derwent London, Piercy&Company developed three shades of Kolumba to match the sandstones. Originally the Turnmill-building architects and its client intended to use a dark gray Kolumba, but they decided three bright colors Kolumba. A total of 85, 890 handmade bricks incl. 27 special bricks were produced for the facades. The original building on the site was a stable in several floors that housed the London Underground workhorses. The Turnmill Building, designed by Piercy&Company, receives the Brick Award. 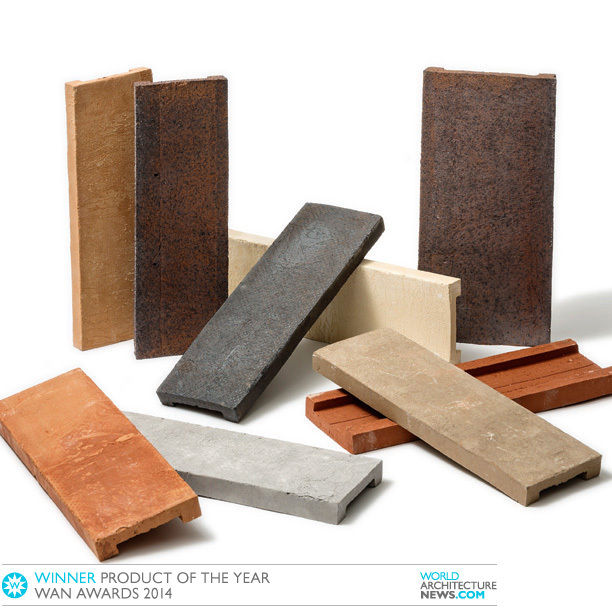 The Brick Development Association hosted the Brick Awards in London on 18 November. Turnmill Building (described in Petersen no. 32) received the award in two categories: 'Best International & Worldwide Project' and 'Specialist Brickwork Contractor of the Year' in which the construction company, Swift Brickwork Contractor Ltd, received the award for the Turnmill building. The Turnmill Building, designed by Piercy&Company with Derwent London as a client, was completed last year. 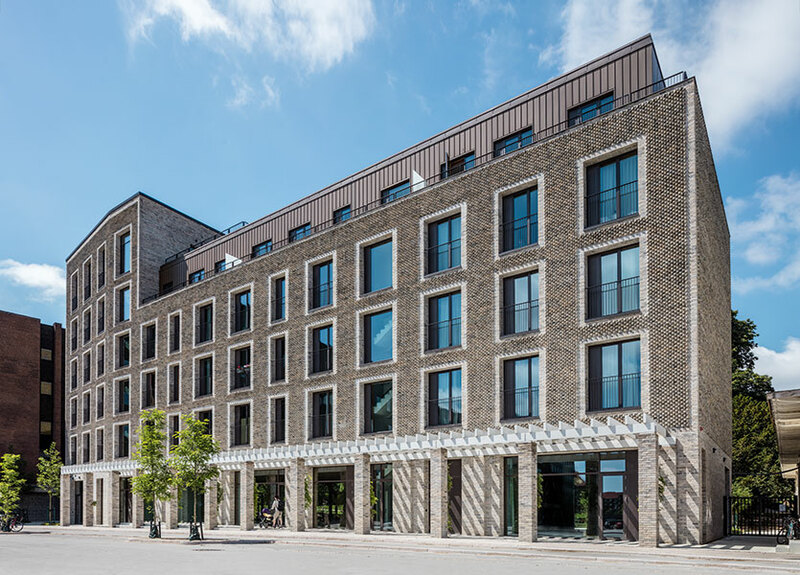 The exceptionally beautiful building is located in the historic Clerkenwell in London, and architects and client did a huge work in architectural design and adaptation to the environment. And here played the choice of materials a very central role. Among many demands the building should live up to its predecessor on the site, a stable built in the late1800s in several floors, which originally housed the London Underground workhorses. Likewise, the new building adapted to the neighboring, listed Session House, built in 1780 in sandstone in various shades of gray. The solution was to develop the handmade Kolumba in three bright shades, F56, F58, F59. The three bricks were mixed and constitute the facades’ delicate, finely woven masonry. We highly recommend visiting the Turnmill street! A number of old lime trees stand both within and outside Maggie's Centre. Reiach & Hall Architects used both K71 and D71 in Flensburg format – in nine different sizes – to create perforations in the brickwork. The 56-metre-long Turnmill building appears being divided in two, due to the centrally placed atrium and main entrance. The facade is built of handcrafted Kolumba. The architects have combined sandstone and D71 in the facades. At the brickworks we are pleased to have delivered bricks to a number of projects nominated for various awards in 2015. Maggie's Centre in Lanarkshire, Scotland, designed by Reiach & Hall was nominated for the prestigious RIBA Stirling Prize, awarded in October in London. The prize went to Burntwood School, in Wandsworth, London by Allford Hall Monaghan Morris. Clay Keramik Museum Danmark (Clay Pottery Museum) on the island of Funen, reopened on May after a shutdown period of two years. Clay Keramik Museum Danmark (Clay Pottery Museum) is the name of a museum in Middelfart on the island of Funen, which after a shutdown period of two years reopened 20 May this year. The reopening marks the inauguration of a new branch of the museum, a new building, designed by the Danish architectural firm, Kjær and Richter. The new building was built with a facade of brick elements in varied, reddish brown color, provided by Petersen Bricks. The brick elements in the facade occur in three different sizes and are used as slats carried by pivoting steel frames that can be placed in different positions. Clay Pottery Museum Denmark houses a permanent exhibition including a large collection of Royal Copenhagen porcelain, but also offers alternating theme exhibitions. 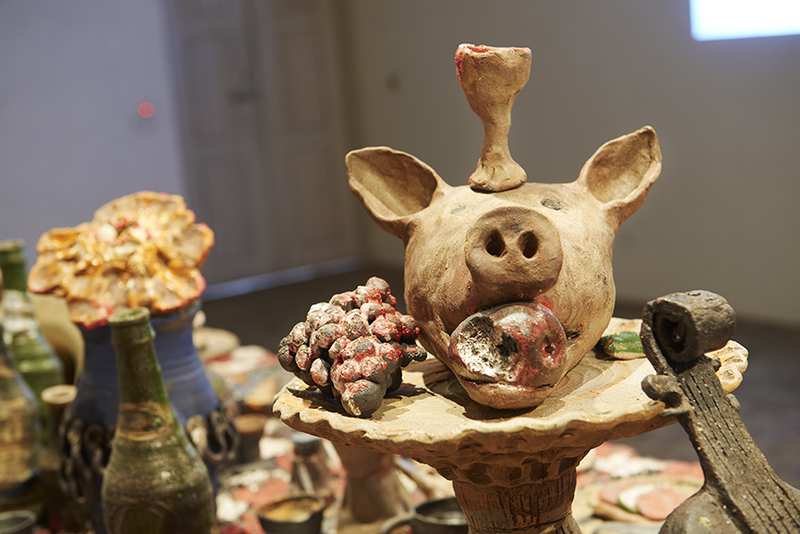 The opening exhibition Brandes & Bindesbøll – Bonds & Breaks shows the works of two Danish artists who have created important ceramic pieces many years apart. With his position as an groundbreaking ceramic pioneer in the late 1800s, Bindesbøll ceramics represent a source of eternal inspiration. Not least for one of our greatest living artists, Peter Brandes. 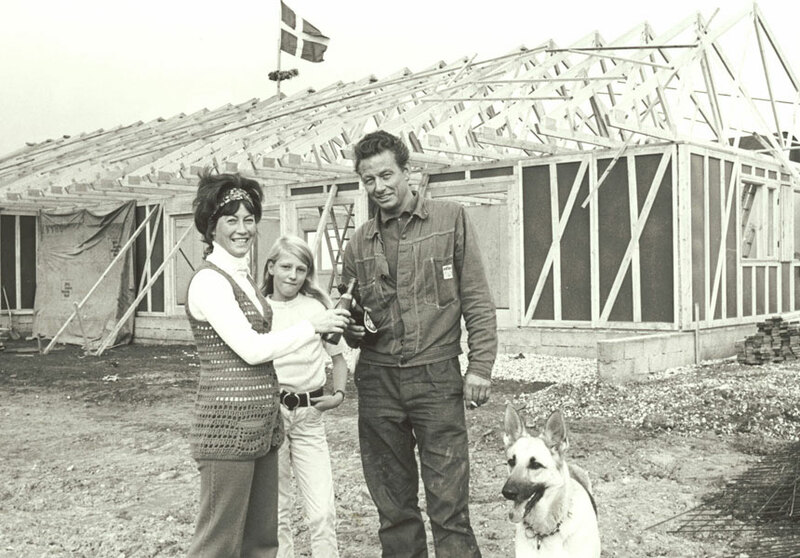 Martin Persson from Tegelmäster, Ida Præstegaard, Ella Bladt. Peter Zinck and Annette Petersen from Petersen Tegl. On 5 May, Tegelmäster in Bara had invited business partners and other friends of the house. The occasion was the new exhibition of Petersen Tegl products incl. 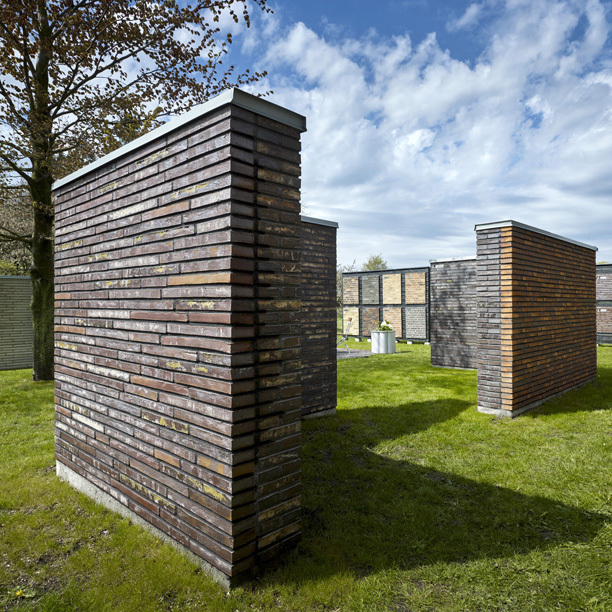 walls with Kolumba, D bricks and Petersen Cover, which can now be seen in the garden at Tegelmäster. Approximately 65 guests – including many architects – had accepted the invitation with subsequent lunch. Petersen Cover is available in 14 different colours and in two sizes: 528mm x 170mm x 37mm and 528mm x 240mm x 37mm. Petersen Cover was developed in corporation with Min2 Architects, who developed a prototype for their villa in Bergen aan Zee in the Netherlands. Petersen Cover was developed further in corporation together with Danish architects, Lundgaard & Tranberg, for Sorø Art Museum in Denmark. “This is how bricks should be made; this is a beautiful handmade product. I would use this.” Said Jury member and Brendon Moss when the jury of World Architecture News Award (WAN) awarded Petersen Cover the best product in the category Product Innovation/Facades 2014. The prize for product design often goes to a high-tech solution, which makes it all the more remarkable that WAN chose to honour a brick product among the many nominations from all over the world. The first brick was produced from water and clay in Mesopotamia around 3000 BC, and has hardly changed since then. Petersen Cover is also made of clay and water. Like other Petersen bricks it is handmade using wooden moulds in a process that has changed little for hundreds of years. The innovative aspect is the design. 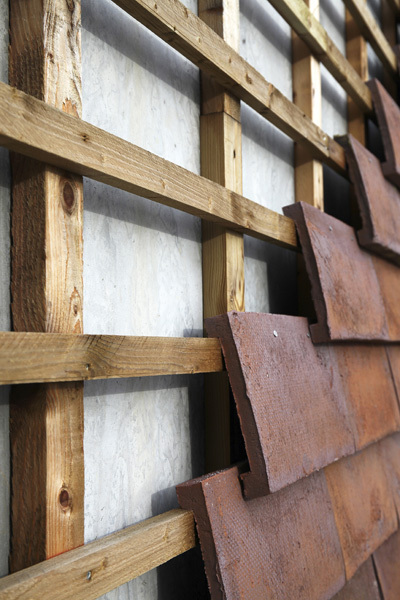 Unlike traditional brick, Petersen Cover doesn’t require mortar and trowels. Petersen Cover is attached – firmly and with precision – to the underlying steel or wooden structure of the façade or roof. Installation is quick, simple, vandal-proof and not dependent on the weather. 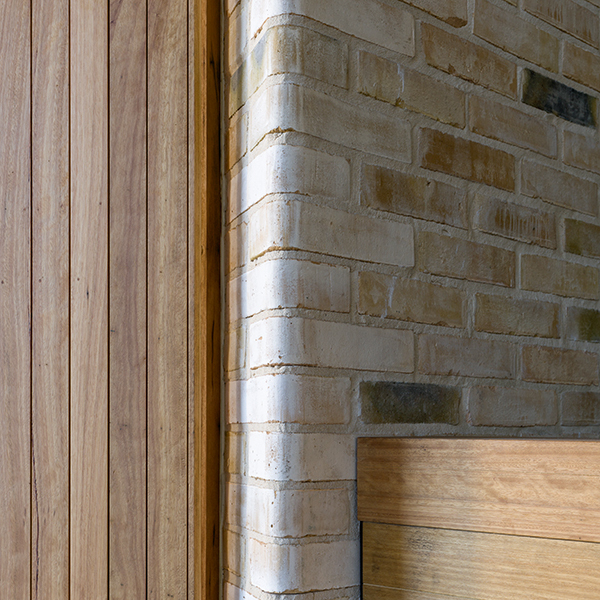 Unlike traditional brick, which is laid with mortar, Petersen Cover is removable and infinitely recyclable. The absence of joints makes finished surfaces 100% maintenance free. Petersen Cover was developed in corporation with creative architects. Min2 Architects developed a prototype for their villa in Bergen aan Zee in the Netherlands and the Danish architects, Lundgaard & Tranberg, developed it further for Sorø Art Museum in Denmark. The combination of English and German clay makes Petersen Cover extremely strong and water resistant. It is available in 14 different colours and in two sizes: 528mm x 170mm x 37mm and 528mm x 240mm x 37mm. Granite-paved paths lead the way to the main entrance. Petersen no. 31 is released and the print run of 97,000 copies are distributed to architects, builders and other stakeholders worldwide. 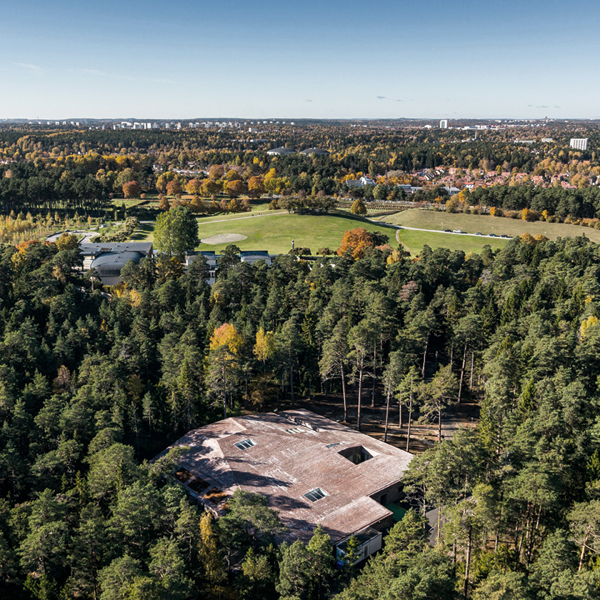 "A stone in the forest" Johan Celsing called his daring competition proposal for the new crematorium at Skogskyrkogården in Stockholm, with its buildings by Gunnar Asplund and Sigurd Lewerentz long since on the UNESCO World Heritage list. In the latest issue of Petersen we tell about Celsing’s new crematorium built in Kolumba. 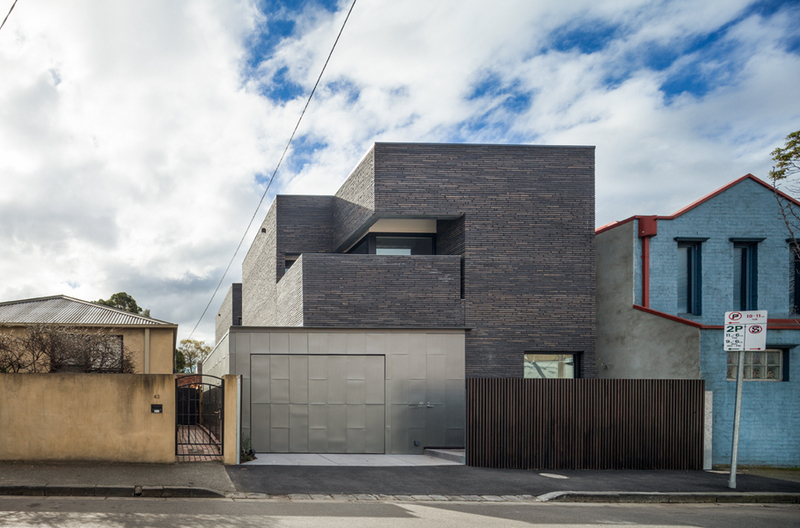 We also present Petersen's first Australian project, a villa in Melbourne designed by Robert Simeoni, built in K55. To their extension to the railway station in Bad Homburg architects Mailänder Consult searched for just the right brick and chose K46 to match the red sandstone, which the original imperial station from 1907 is built in. To a large villa near Utrecht Petersen Brick produced three different Kolumba in special lengths of which the longest is 920 mm long. The architect is Hilberink Bosch Architecten, who over the years has used Petersen products in a number of projects. You can receive Petersen 31 by writing to Petersen Tegl on info@petersen-tegl.dk or view the digital version on our website. Villa in Sint-Martens-Latem, Belgium, designed by Architectenburo Berkein. Brick: K11. Villa in Los Angeles, designed by Marmol Radziner. Brick: K55. Townhouse in Barcelona, designed by Marc Puig Mengual. Brick: K91 and D91. Townhouse in Manhattan, New York, designed by Grzywinski + Pons. Brick: D81. Petersen no. 40 is published in early May and then distributed worldwide. In the magazine we present e.g. the new LAM (Lisser Kunstmuseum) in the Netherlands, designed by KVDK Architecten, who in collaboration with Petersen Tegl developed two special editions of Kolumba for the building. 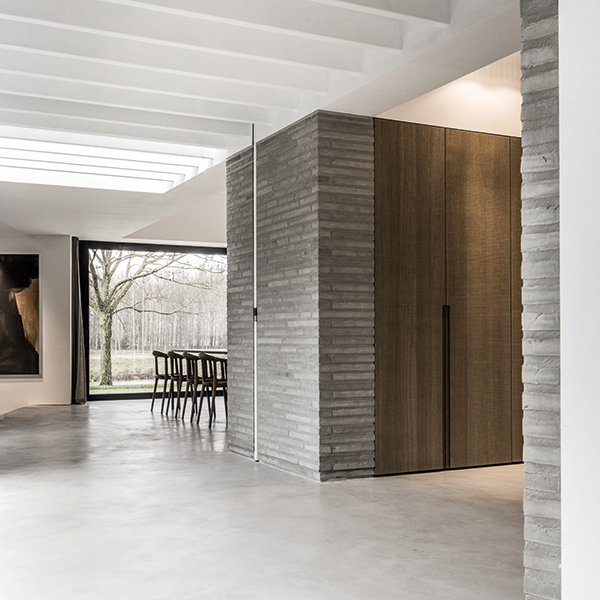 We also bring articles about a number of very different homes, including a villa in Sint-Martens-Latem, Belgium, using K11, designed by Architectenburo Berkein. A villa in Timmdorf, Germany, using C48, designed by Wacker Zeiger Architect. 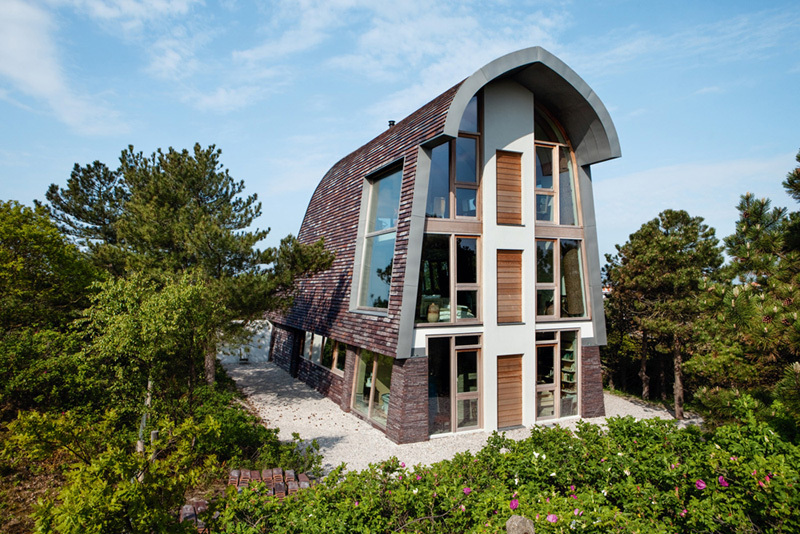 A villa in Denmark, in K91, designed by ADEPT. A villa in Los Angeles, built in K55, designed by Marmol Radziner. A townhouse in Barcelona, ​​built in K91 and D91, designed by Marc Puig Mengual and a townhouse in Manhattan, designed by Grzywinski + Pons, who chose D81 for the building. Request PETERSEN in Danish, English or German by writing to info@petersen-tegl.dk or see the magazine on our website. All of the windows and street doors are edged with protruding brickwork flush with the rhombic pattern in the same brick on the rest of the façade. 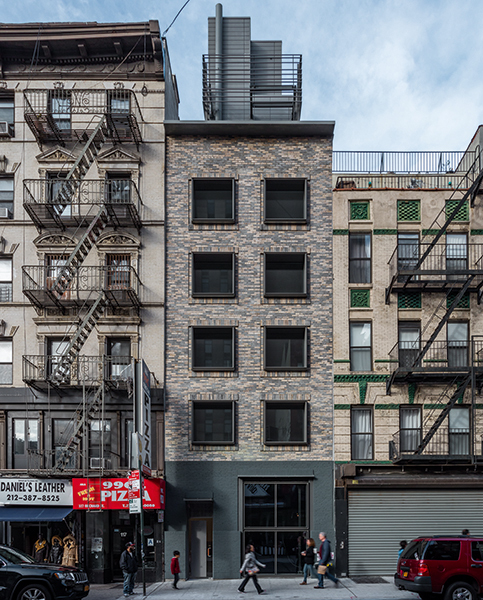 At street level, the façade is defined by a high, wave-patterned band of concrete, which acts as a visual foundation for the brick-clad floors above. The look of the six-story building is reminiscent of 1930s residential architecture. Tall windows provide ample daylight and large balconies allow for outside living. 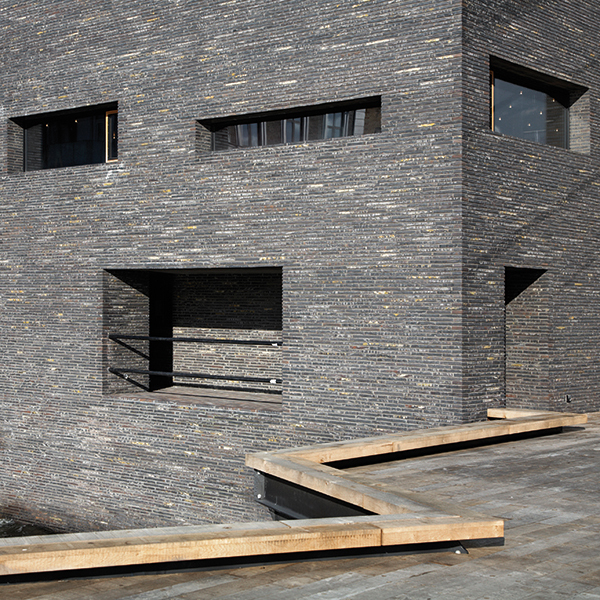 Bollinger + Fehlig Architekten chose the coal-fired D72 for the facade in Saarbrücker Strasse. The light brick and the white balconies harmonise with the colours in the rest of the street. In Petersen magazine no. 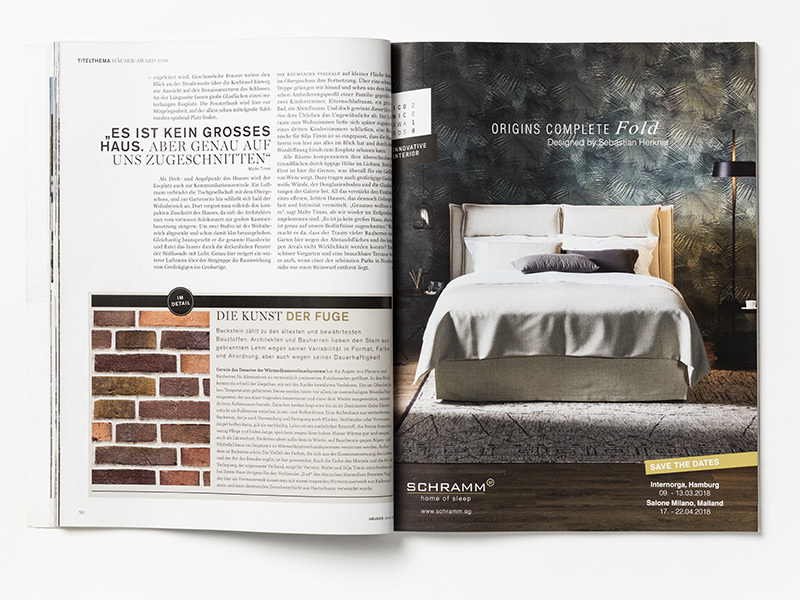 39 page 14, we published an article about a residential block in Saarbrücker Strasse in Prenzlauer Berg, Berlin. However, we credited the wrong architect as responsible for the building's façade. The responsible architect is Bollinger + Fehlig Architekten GmbH BDA. We apologise for the error. Please find a brief presentation of the building below. The residential block in Saarbrücker Strasse is a six-storey building with 33 properties for rent. The external façade is adorned with yellow coal-fired D72 bricks, arranged in a striking and distinctive rhombus pattern. At street level, the façade is defined by a high, wave-patterned band of concrete. This provides the visual foundation for the brick-clad floors above, the tall windows and big white balconies, all of which comes together in a rounded malleable idiom. The building also has a pleasant back yard, and the hilltop location affords views across central Berlin from several of the flats. One of the reasons D71 was chosen was that it exudes a softness reminiscent of aged sandstone. The round tables in the café are made of hard, blackbutt wood, as is the vast ceiling. Petersen produced a number of customised bricks, including some with rounded corners. The two bearing walls are at 18, 22, 40, 54, 60, 108 and 118-degree angles. Maitland Riverlink is next to the Hunter River, which has historically been an important transport route for the city. The recently competed Maitland Riverlink in New South Wales, has received the “2018 Blueprint Award for the Best Public-Use Project with Public Funding”. Designed by the renowned Sydney-based architects CHROFI, the building serves as both a covered urban space for outdoor events and as a social hub with a café and restaurant. It also forms a gateway between the main street and the Hunter River. Petersen no. 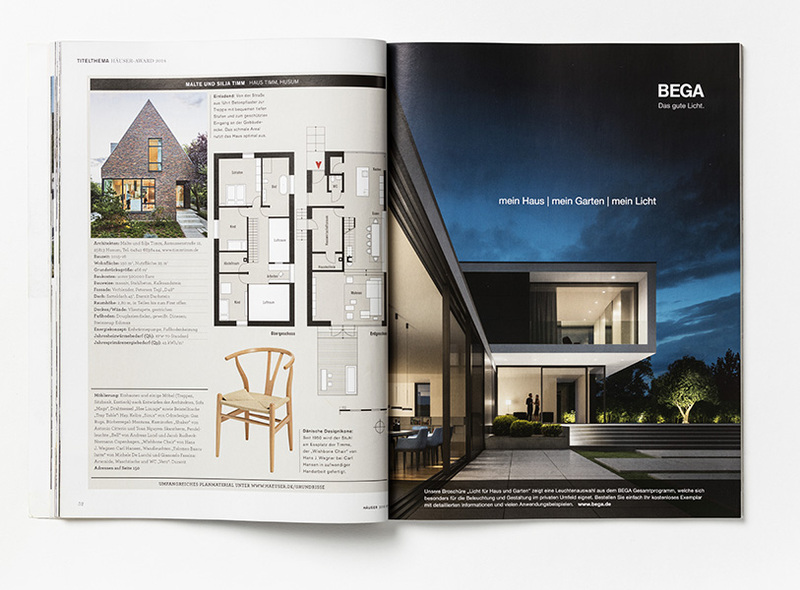 39, published in October, contains an article about the building. Amerika Plads is named after the large freight and passenger ships which used the dock close to the square many years ago. The building, housing Petersen Tegl, is next to a large copper-clad building designed by Arkitema for Plesner Attorneys. From the new showroom there is a view of a famous building in Copenhagen - the small, former station building built in 1895, designed by Heinrich Wench, who was also the architect of Copenhagen Central Station. Amerika Plads is situated close to Nordhavn and close to Copenhagen city center. Petersen Tegl has been on the lookout for a suitable showroom location in Copenhagen for a long time, and now one has been found. In a few months, the brickworks will open the doors to a large, bright showroom on Amerika Plads 25b, close to the city centre and Nordhavn, Copenhagen’s attractive new district. We look forward to welcoming all our customers from Denmark and abroad to America Plads! Hut in Sirdalen, Stavanger, architect: Link Arkitektur. Brick: C48. Central Park, Nordhavnen, Copenhagen, architect: Årstiderne Arkitekter. Brick: D46. Fortkaj, Nordhavnen, Copenhagen, architect: Mangor & Nagel. Brick: D48. The Asprey Building and Cabinet Gallery, London, architect: Trevor Horne Architects. Brick: K57, K43. Victorian Square, Colorado, architect: Rowland+Broughton Architecture. Brick: C48. Restoration of St Paul’s Church spire. Custom brick developed in collaboration with the architects Toyberg-Frandsen and the contractor and master builder Guldmann Dam Pre-Prenor A/S. The new edition of PETERSEN magazine is now being sent to readers all over the world. One of the articles is about the new Museum of the Bible in Washington, designed by SmithGroupJJR, which uses brick from the Kolumba range as a reference to the ancient scriptures exhibited in the museum. Another article presents the Nordhavn waterfront district in Copenhagen, which has been transformed into a new and desirable area to live. Under the theme ‘Art Galleries in the UK’ this edition features three buildings that use brick cladding on their façades in different ways. The magazine also presents two buildings – one in Norway and one in Colorado – that use the same C48 brick for cladding, as well as the project to restore the spire on St. Paul's Church in Copenhagen, for which Petersen developed customised bricks. PETERSEN is available in Danish, English and German. Request your copy now from info@petersen-tegl.dk. You can also view the magazine on our website. The artists worked intensely at Petersen Tegl’s brickyard, with an occasional hand from the staff. 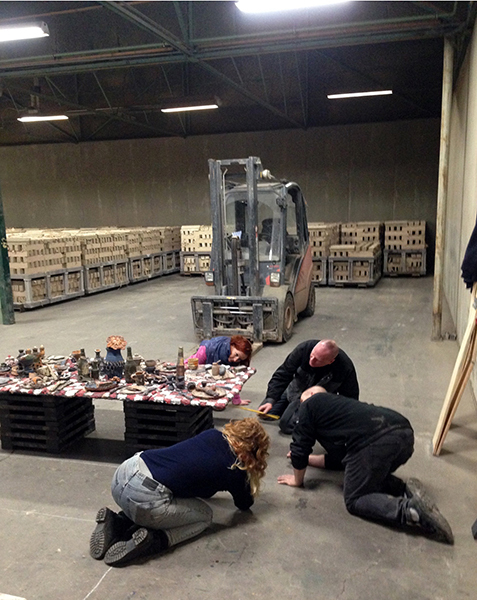 600 kilos of clay were donated to the project of creating Jorn’s Last Meal. Photo: Thomas Drejer. 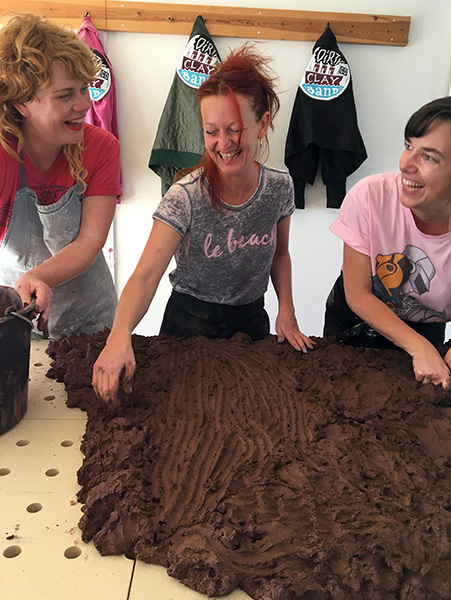 The sculpture was created in a ‘clay performance’ in an apartment in Aarhus, as part of the Aarhus City of Culture 2017 programme. Photo: Thomas Drejer. 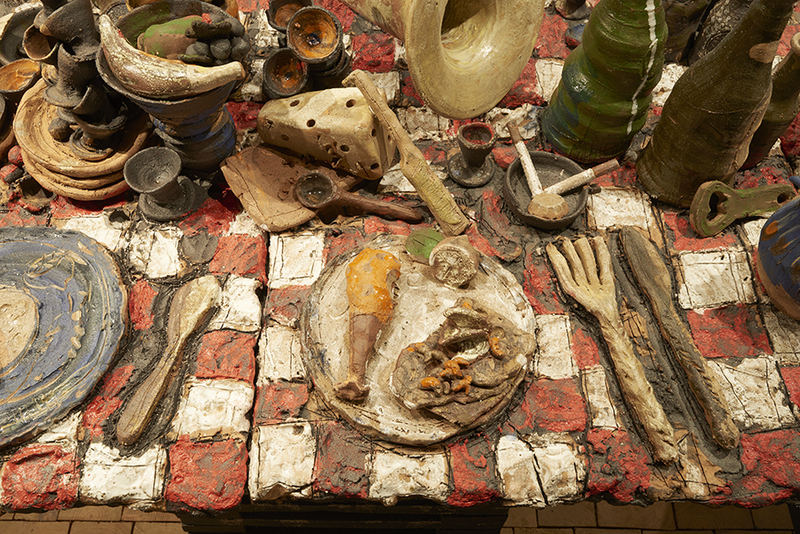 The artists created all the objects for the table in a week. Then all the parts were transported to Petersen Tegl, where they were glazed and fired. Photo Thomas Drejer. A festive table. The finished sculpture was exhibited at Museum Jorn in spring 2018. Photo: Martin Schubert. There are lots of details to explore in Jorn’s Last Meal. Photo: Martin Schubert. Baked clay can definitely create a festive atmosphere! Photo: Martin Schubert. 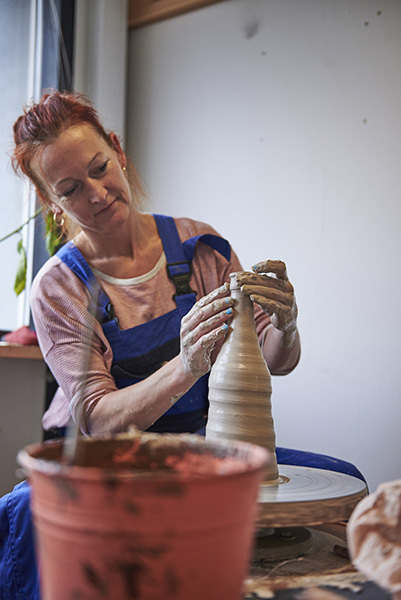 A couple of years ago, Louise Gaarman, Lea Nielsen and Mette Maya Gregersen – three ceramic artists who work together under the name Dirty Go Clay Band – were given a grant to work in Asger Jorn’s former studio on the Danish island of Læsø. There they explored the photos, articles, furniture and other items from Jorn’s time, and became curious about what his last meal might have looked like. 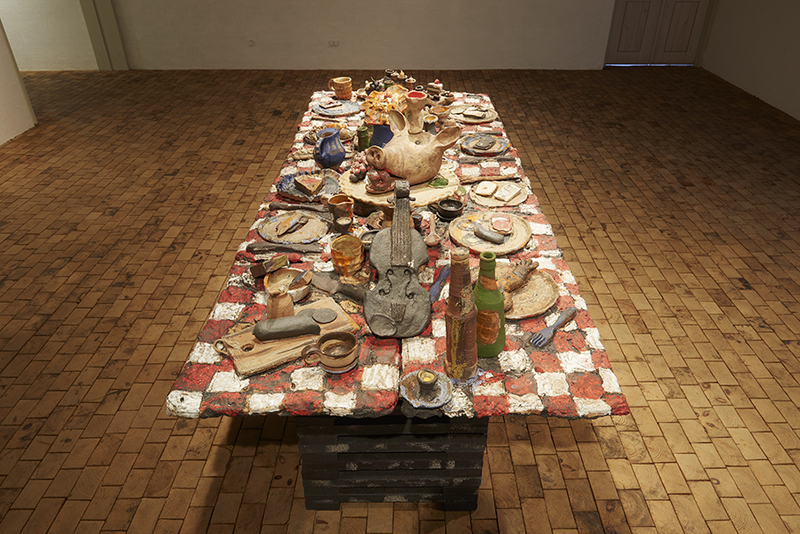 The idea was turned into an artwork – Jorn’s Last Meal – created in a seven-day ‘clay performance’ as part of the Aarhus City of Culture 2017 programme. 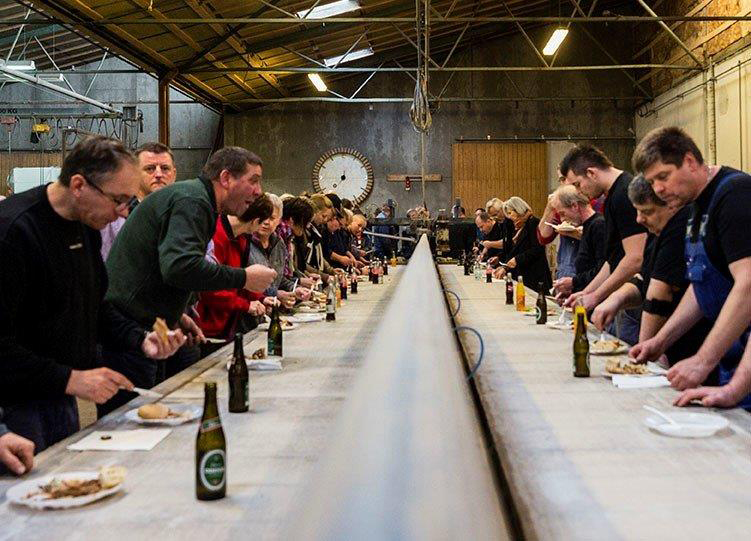 Sponsor Petersen Tegl provided 600 kilos of clay, which was transformed into a sculpture: a festive table twenty metres long, with sandwiches, spirits, tobacco, musical instruments and more. The finished sculpture was fired by Petersen Tegl and transported to Museum Jorn, where it received much attention as a pop-up show in the spring. ‘Danish Design’ by Thomas Dickson is published by Gyldendal Publishers. Hans J. Wegner designed the Wishbone Chair in 1958 for Carl Hansen & Son who have produced the chair ever since. Henning Koppel’s pitcher, often referred to as the pregnant duck, was designed by Koppel in 1952, and has been produced ever since by Georg Jensen. Hallingdal, designed by Nanna Ditzel in 1964 for Kvadrat who still produces the textile. A section of ‘Danish Design’ is dedicated to the story about Petersen Tegl, including Lundgaard & Tranberg's modification of Kolumba for the Royal Danish Playhouse project. Mogens Koch’s famous book cases from 1957 are produced by Carl Hansen & Søn. Poul Henningsen's first PH pendant saw the light of day at a Paris exhibition in 1925. Subsequently, the unique lamp designer developed a wide range of variants on the model of this ingenius lighting concept. The 670-page book 'Danish Design' by architect Thomas Dickson, first published by Gyldendal in 2006, has been revised and is now out in a third edition. The book contains a chapter on Danish building materials in which brick obviously plays a central part. 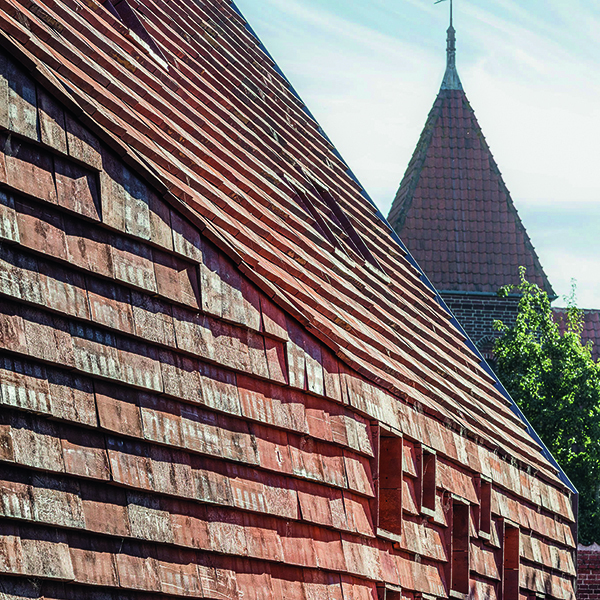 As the only brick manufacturer appearing in the new edition, Petersen Tegl is presented in a major section relating the story of the 227-year-old brickworks in Broager and the many different kinds of bricks produced there, i.e. Peter Zumthor's Kolumba, modified by Lundgaard & Tranberg for the Royal Danish Playhouse in Copenhagen. At Petersen Tegl, we are delighted and proud to see our bricks presented side by side with design icons such as Hans J. Wegner's Wishbone Chair, Henning Koppel’s pitchers, Mogens Koch's bookcases and Poul Henningsen’s lamps. Blue-tempered brick paving at the entrance to the exhibition “Clay Tiles & Red Wood”. The white room is filled with works made of natural materials: sequoia wood and fired clay. A brick plinth provides a platform for ceramics and an oak twig. Tableau with brick, ceramics and eucalyptus. A Kelim rug, a base of blue-tempered brick, a table top of sequoia, pine and bamboo. The title of the exhibitions quite literally reflects the contents. The Copenhagen gallery Last Resort, Borgergade 2, owned by Peter Amby and Andreas Henningsen, currently houses the exhibition “Clay Tiles & Red Wood” by artist and graphic designer Natsuko Uchino. By bringing together works created from natural materials, including sequoia wood, Uchino sought to create an “outdoor space inside”. 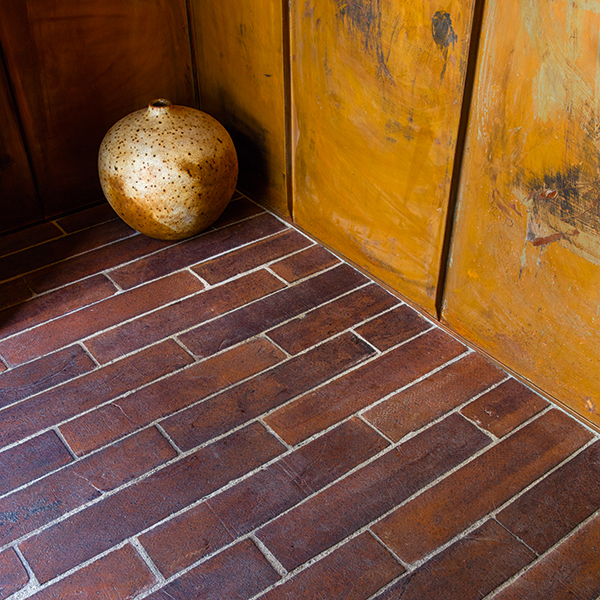 Another natural material, which has been used for the floor and in various free-standing works, is brick by Petersen. The exhibition also includes bowls and other everyday ceramic objects. The exhibition runs until 20 January 2018. St. Paul's Church is beside Nyboder in Copenhagen, which was originally built as housing for the Royal Danish Navy in the 17th century. The spire on St. Paul's Church features a spectacular pattern with glazed and unglazed brick in the three shades. The topping-out ceremony on 21 September this year. Erich Mick told the audience how the new bricks for the spire came about. Moulded glazed brick in shades of green for the spire. Moulded unglazed brick for the spire. St. Paul's Church in Copenhagen, originally built 1872-1877, is undergoing a major renovation, including the replacement of the bricks at the top of the conical spire. Erich Mick, head of the department at Petersen Tegl which produces moulded bricks, took up the challenge. The pattern includes unglazed bricks as well as glazes in three different greenish shades. Reproducing the original colours was a huge challenge, but after many experiments and tests with temperatures and different ways of stacking the bricks in the furnace in Broager, Erich and his team nailed it. 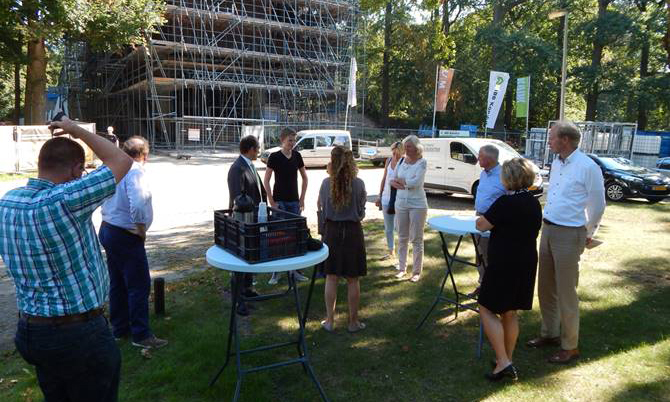 The end result was admired by everybody who attended the topping-out ceremony on 21 September this year. Petersen no. 36 is now available and is being distributed all over the world. This time, among other things, we’re presenting a house designed by Nick Tobias Architects, on Bondi Beach in Australia. Mika Utzon Popov has created a work of art in the house, which was produced at Petersen Tegl. The Danish projects presented include Campus Odense, designed by C F Møller Architects, the Psychiatric Hospital in Slagelse, designed by Karlsson Arkitekter, as well as the Harbour Houses and the Canal Houses in Aarhus, designed by Luplau Poulsen and Adept Architects. A building in Seoul, designed by Stocker Lee Architetti, a company domicile in Lodz, designed by Horizone Studio, and homes in St Andrews, designed by Sutherland Hussey Harris are among the projects abroad included in this issue of the magazine. The award was presented to Peter Zinck. Petersen Tegl by Franz Josef Pschierer, Staatssekretär im Bayerischen Staatsministerium für Wirtschaft und Medien, Energie und Technologie. Exempla seeks to bring the crafts to life, and so staff from Petersen Tegl mounted and dismounted Petersen Cover every day during the exhibition. Employees from Petersen Tegl installed the exhibition. A wide range of products were exhibited. The happy winners at the international crafts fair in München. At a time when digitisation and the virtual world are encroaching into almost every sphere of our lives, there is also increasing interest in genuine, natural materials and craftsmanship. One body to notice this is the Chamber of Crafts and Trades for Munich and Upper Bavaria. For 46 years – as part of the international crafts fair – the chamber has hosted the special exhibition Exempla, which this year took place on 8–14 March. In 2017, the fair focused on the importance of exceptional skill, via the theme Material Values in the Crafts, and Petersen Tegl was one of 31 companies invited to showcase their products. Petersen Tegl was delighted to receive an award for Kolumba, in the category “Particularly creative and technical performance”, from the Bavarian Ministry of Economic Affairs and Media, Energy and Technology. The glass section on the ground floor makes it possible to view the ruins at night. 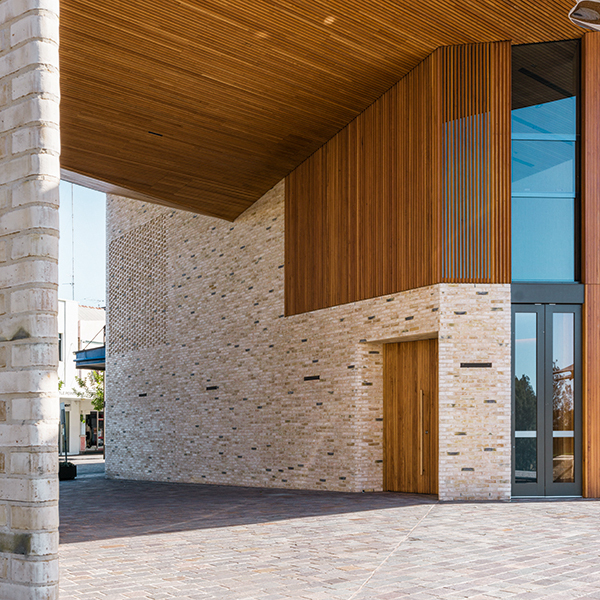 The prize from the “City of Esbjerg Fund” was awarded jointly to the architects Lundgaard & Tranberg Architects and the client Ribe Cathedral Church Council. The parish hall runs along the south side of Ribe Square. Ruins dating back to the 12th century were unearthed during the excavation work, and are now on view in Kannikegården. The brick cladding on the roof and façades blends in beautifully with the medieval buildings in the area with their variety of shades of red brick. Both the roof and the façade are clad with Petersen Cover in specially chosen colours and the custom-made format 630 x 350 x 50 mm. The artificial lighting on Ribe Square is particularly apt and atmospheric. 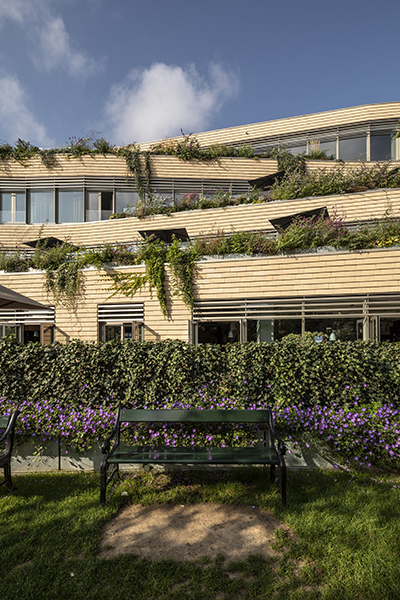 In a statement, the Fund said: “In architectural terms, Kannikegården succeeds in being honest and modern while showing great respect for the buildings around it in its historic setting in terms of volume, shape, height, roof pitch and choice of materials and colours. Bricks shells, glass, steel, copper and load-bearing, concrete pillars with rustic surfaces were all used in the project. The most visible parts of Kannikegården are clad with beautiful reddish-brown customised brick shells, which consist of handmade, hard-fired bricks in a bigger size than classic brick. Read more about Kannikegården in PETERSEN 35. Studio 1 is named after SVT (Swedish Television), which was previously based on the site. Studio 1 consists of 59 flats in two wings. The development will be expanded later with a second phase called Studio 2. The flats in Studio 1 were ready to move into in summer 2016. Studio 1's façades are made of blue-tempered D55 in Flensburg format. D55 is also used in the interiors, where it is combined with blue-tempered acoustic brick by Helligsö Tegl. The buildings are in extremely scenic surroundings. The prestigious Kasper Salin Prize 2016 has gone to Johannes Norlander for his housing development, Studio 1, in Gothenburg. “The fact that the Salin Prize has been awarded to this particular housing development reflects a general desire in Sweden for higher quality housing,” wrote editor-in-chief of Arkitektur i Sverige (Architecture in Sweden), Julia Svensson. Lundgaard & Tranberg designed an elongated, brick-clad building beside the Cathedral. The seemingly random positioning of the windows reflects the uneven pattern of the granite paving stones on the square. Klosterhaven conveys a terrain jump on the site, which has been transformed into a beautiful garden by Schønherr landscape architects. The building is clad with Petersen Cover in a special edition, which measures 630 x 350 x 50 mm and weighs 15 kg. The new extension faces the original Kunstmuseum Basel, built in the 1930s. The bricks alternate between dark and light grey and divide the facade into horizontal bands. A frieze in the façade uses LED lights as a flexible banner. Petersen Tegl produced customised bricks with a concave mould to make room for the LED lights. Among the projects featured in the new issue is Kannikegården, the new parish hall in Ribe, Denmark, which was designed by Lundgaard & Tranberg Architects. In terms of form and material the new building fits beautifully into the medieval town, where it has the imposing 12th-century cathedral as its next door neighbour. The façades and roof are clad in a special edition of Petersen Cover designed by Lundgaard & Tranberg. 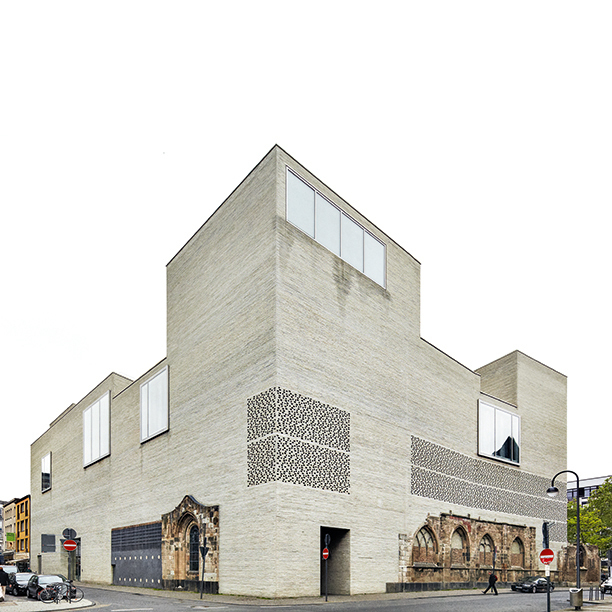 The magazine also presents the new extension to Kunstmuseum Basel, designed by Christ & Gantenbein, a spectacular, modulated volume with façades in several shades of grey brick that interacts beautifully with the original building from the 1930s. If you would like a copy of the magazine, please e-mail Petersen Tegl on info@petersen-tegl.dk or view the digital version on our website. 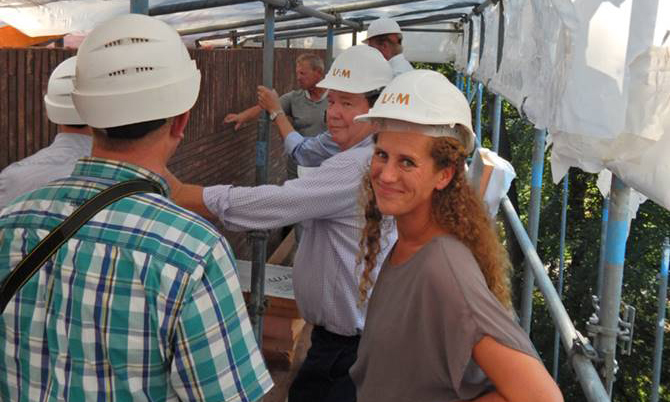 The award ceremony for the best construction with Junior bricks took place with a view to the scaffolding around Lisser Museum, designed by Korbee van der Kroft Architects. The jury for the competition for Junior bricks-buildings. From left: Lineke Lucassen from Petersen Tegl, architect Arie Korbee from Korbee van der Kroft Architects, brickworks owner Christian A. Petersen, Jan-Willem van der Plas from IBB Kondor and Gerard Polman from GPO Advies. Christian A. Petersen handing over the prizes to the two winners of the competition, Daan and Merijn Weijers who are nephews and respectively 13 and 14 years old. Visit on the scaffolding around Lisser Art Museum, which is covered with Kolumba. 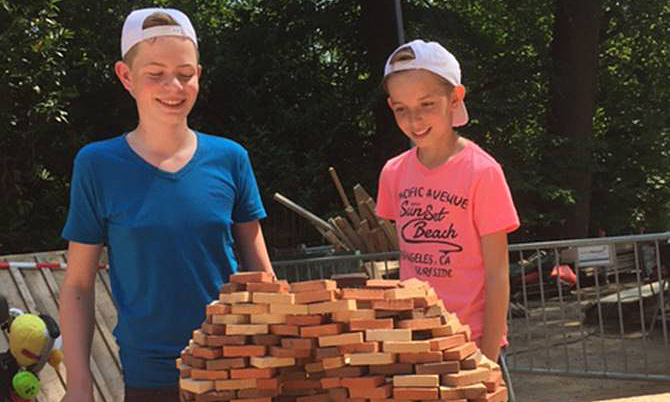 39 children participated in the competition in June to create buildings in Junior bricks, which was won by Daan and Merijn Weijers. 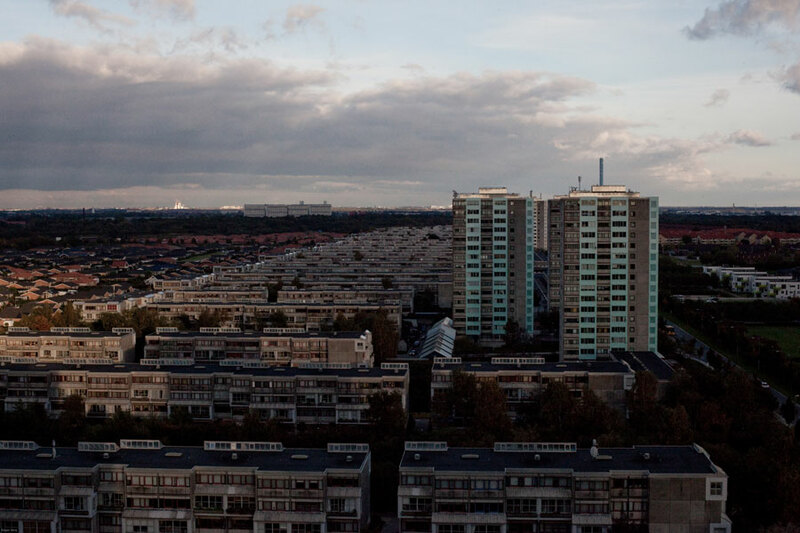 Once a year you have the opportunity to experience how the Dutch construction sites look inside. A number of construction sites open their fences and invite you in on »Construction Day«, ‘Dag van der Bouw', which this year was on 4 June. The construction site for Lisser Art Museum was one of the places that could be visited, and the day was a huge success with around 1,100 guests. The museum, which will exhibit art owned by Vandenbroek Foundation, will be covered with Kolumba by Petersen, and building contractor, IBB Kondor, had therefore asked Petersen Tegl to be part of the event. The award ceremony took place 13 September at the construction site where Christian A. Petersen presented the prizes: two large boxes of LEGO to the lucky winners, Daan and Merijn Weijers. Every morning between seven and eight a.m., Christian A. Petersen makes a round at the brickworks where he speaks with many and says good morning to all. The yellow-washed house has been the setting of the family Petersen's life for many generations. After the purchase and remodeling in 2015 of the neighbouring Tychsens Brickworks, Petersen doubled the production of Kolumba. The Levring House, designed by Jamie Fobert Architects, is located in the middle of beautiful Bloomsbury and listed in D72, FF and K70. The approximately 800 year old Maagdentoren collapsed partially in 2006. 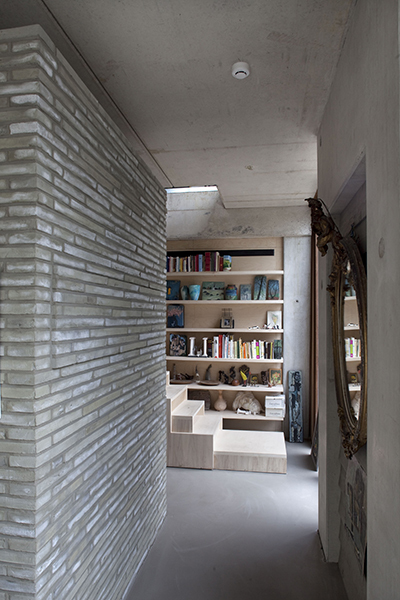 Studio Roma became responsible for the restoration together with De Smet Vermeulen Architekten. Christian Tranberg Architects have designed two new traffic towers, built in D48, in Copenhagen and Fredericia. In a few years the towers will monitor all rail and road traffic in Denmark. Artist Henrik Plenge Jacobsen has designed the ground floor of Tower East in a pattern of handmade tile produced by Petersen Tegl. He has also created Foucault’s pendulum in the same tiles. Link Architecture designed the new mortuary at Norrtälje Hospital performed in pattern masonry. Inside D72 is used and outside D36. In the new issue of PETERSEN we mark that this year it is 225 years ago, Petersen Tegl got royal permission to produce bricks. Since then it has been non-stop for the brickworks - with the opening in 2015 of a new brickyard as the latest big event. The extension was necessary so that we could meet the growing demand from the 39 countries to which we deliver bricks. Among the many exciting projects in no. 34 we present a residence in London, designed by Jamie Fobert Architects, a restoration of a medieval tower in Belgium, performed by Studio Roma and two traffic towers in Denmark, designed by Christian Tranberg Architects. Receive PETERSEN in Danish, English or German by writing to info@petersen-tegl.dk or see the magazine on our website. BASE Milano is the name of a new culture workshop and exhibition space created in a former industrial hall of 6,000 square meters. The cubes designed by Onsitestudio, built in coal-fired D58 in Flensburg format in shades of gray, are carried out as pattern masonry, used as bar, storage and toilets. The exhibition with the title ’Honor imperfection as a hidden intention’ can be seen in the Academy of Fine Arts in Brera, Milan, until 12 June this year. In Academy of Fine Arts, Milan, Onsitestudio has organized an exhibition of different tools used for the work by hand in the building process. BASE is housed in a former industriel hall previously belonging to the company Ansaldo in Via Bergogne 34 in Milan. La Triennale di Milano embraces exhibitions and events in art, design, architecture, fashion and film, and reopened in April this year and ends in September. The Triennale has paused for 20 years, and the first one was the 1923. The Milanbased Onsitestudio (Headed by Angelo Lunati and Gian Carlo Floridi) in cooperation with architect Francesco de Agostini, participate in the Triennale with two projects, one of which is permanent: BASE is a cultural workshop and exhibition and event space in a former industrial building. Onsitestudio used a dark gray coalfired brick to a number of cubes in the large space containing bar, storage and toilets. In the Academy of Fine Arts, Onsitestudio is also responsible for an exhibition that wants to show the traces of manual labour in the construction process. The architects have arranged a collection of tools incl. molds and other equipment used for the production of handmade bricks at Petersen Tegl. With its both modern and traditional expression the new Kannikegård beautifully joins the row of brick buildings around the cathedral. The architects Peter Zinck and Annette Petersen in front of Kannikegården on inauguration day. Torben Smith from Petersen Tegl at the ruins from the 1100s, as seen in Kannikegården. Lundgaard & Tranberg has developed a special edition of Petersen Cover for Kannikegården. The brick measures 630 mm x 350 x 50 mm and each brick weighs 16 kg. 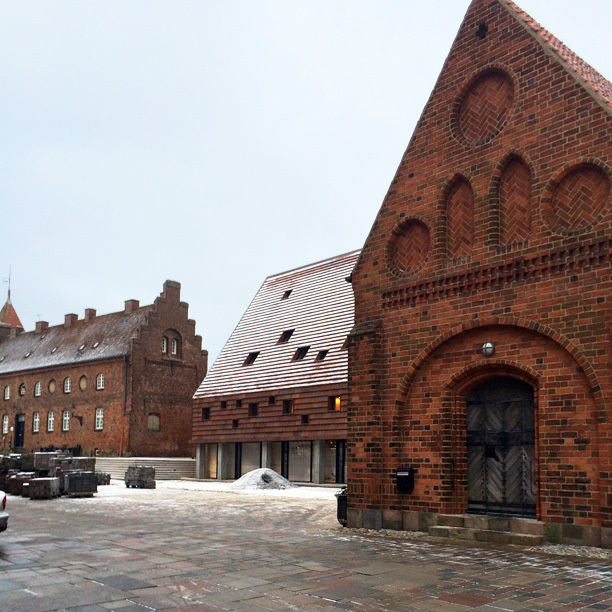 Kannikegården reflects the brick facades of the surrounding, historic buildings facing the cathedral of Ribe. The new building hovers over perhaps the oldest brick building in Denmark: The newly excavated ruins of the Kannike monastery, dating from the 12th century. 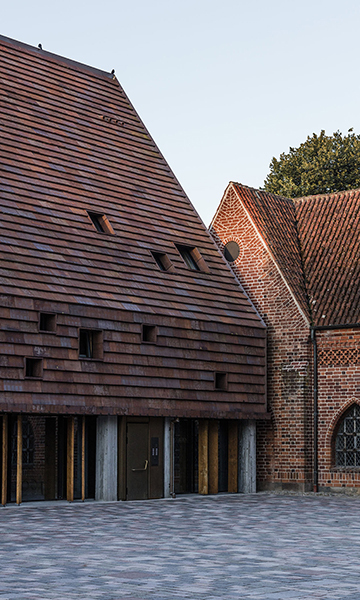 On 21 January an exceptionally exciting building was inaugurated, namely Kannikegården, located in the centre of Denmark's oldest town Ribe, beside the town’s cathedral. Kannikegården, designed by Lundgaard & Tranberg, contains, among other functions, offices for church administration, confirmation rooms and rehearsal rooms for the choir. In addition, it houses the ruins of a medieval monastery, Denmark's oldest brick building, dating from 1100. Kannikegården is lined with an extra large edition of Petersen Cover developed by Lundgaard & Tranberg specifically for Kannikegården. Each brick in the museum’s facades is produced by hand. The new office building at Pancras Square in London is defined by two dark walls that curve around two historic and listed buildings. The new church in Lörrach is done with a powerful and sculptural expression. The European Hansemuseum is performed with a 95-meter long, monolithic facade. The renovation of Vapnagaard is done with masonry in four different colors that ad a new – and most practical – identity to the place. PETERSEN no. 33 is out - now with a circulation of 100,000 copies, and distributed these days all over the world. 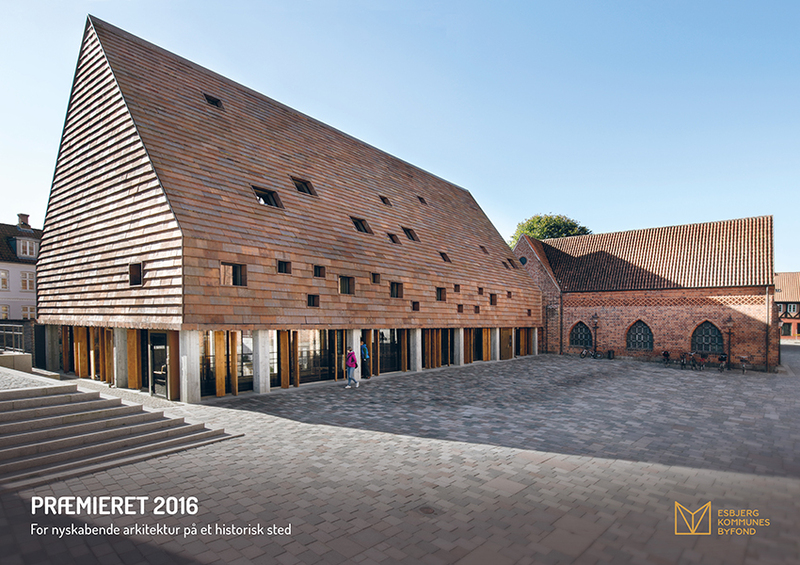 In this issue we present among other projects, the new European Hansemuseum in Lübeck, designed by Studio Andreas Heller and built in handmade bricks. The museum's facades are deliberately carried out with spots in the masonry, as you see it everywhere in the surrounding medieval city. 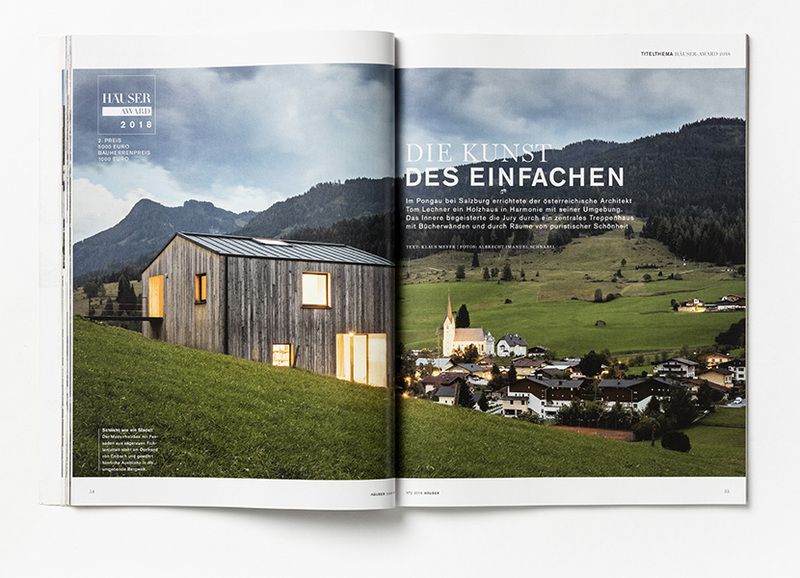 The magazine also tells about a church in Lörrach, designed by Wilhelm und Hovenbitzer und Partner. A new office building designed by Studio Downie Architects and an extensive renovation of the Danish non-profit housing project, Vapnagaard conducted by NOVA5 Architects. Obtain PETERSEN in Danish, English or German by writing to info@petersen-tegl.dk or see the magazine on our website. From the chimney is a nice view of Nybøl Nor and also to the brickworks’ legendary ship, Emma. Christian A. Petersen before surfacing. The chimney is constructed of waterstruck bricks and built in the middle of the 70s. A happy brickwork owner approved chimney repairs and views! One of the chimneys at the brickworks in Broager has recently been repaired and Christian A. Petersen wanted obviously to inspect and approve the outcome. So the brickwork owner came out on top in the 75-metre high chimney and was pleased with what he saw – incl. the beautiful view of Nybøl Nor. The full-brick chimney, which was built in the middle of the 70s, is built of waterstruck bricks and pulls through its height of 75 metres 15,000 cubic meters of air per hour without chimney ventilation. Africa - Architecture, culture and identity is the name of a major new exhibition at Louisiana, which tells about the cultural complexity and social prospects in the world's second largest continent, which the West generally has little knowledge about. Rwanda, for example, is working hard to build roads, schools, enhance tourism, increase the export of coffee and tea - and not least to reconcile the people. In this regard, Louisiana exhibits an installation by Tomà Berlanda and Nerea Amoros Elorduy, co-founders of studio ASA (Active Social Architecture) concerning education and training projects in Rwanda, where one of UNICEF Rwanda's flagship projects is the construction of ECD Centres (Early Childhood Development). An architecturally very successful ECD center is found in Nyamasheke district – beautifully situated in the rain forest and built in red brick. A section of the center is partially rebuilt as an installation at Louisiana - in coal-fired bricks, supplied by Petersen Bricks. Steve Belting, vice chairman of 3F, Sønderborg, presented the award to Christian A. Petersen. Mads Andersen, Dean of Industrial 3F, Steve Belting, vice chairman of 3F, Sønderborg, Christian A. Petersen and Mayor of Sønderborg, Erik Lauritzen. Approximately 100 employees at Petersen attended the ceremony. After the festivities roast suckling pig was served. 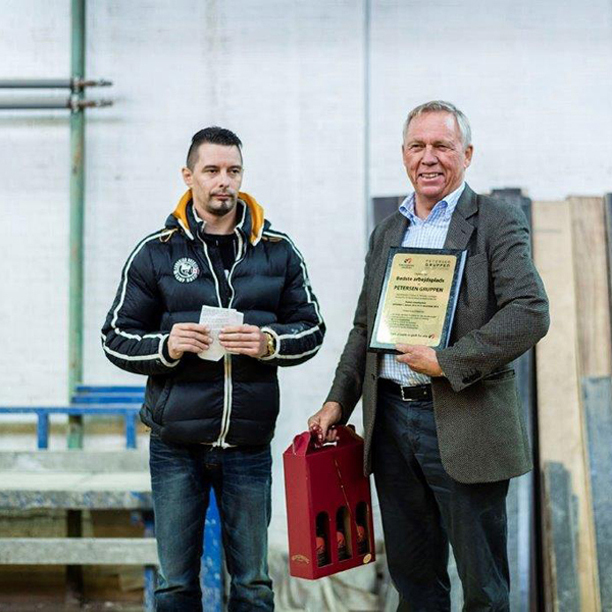 On 7 November this year received Petersen Brick the award for the Year's Best Workplace in the Sønderborg area. The prize is awarded by the union 3F. 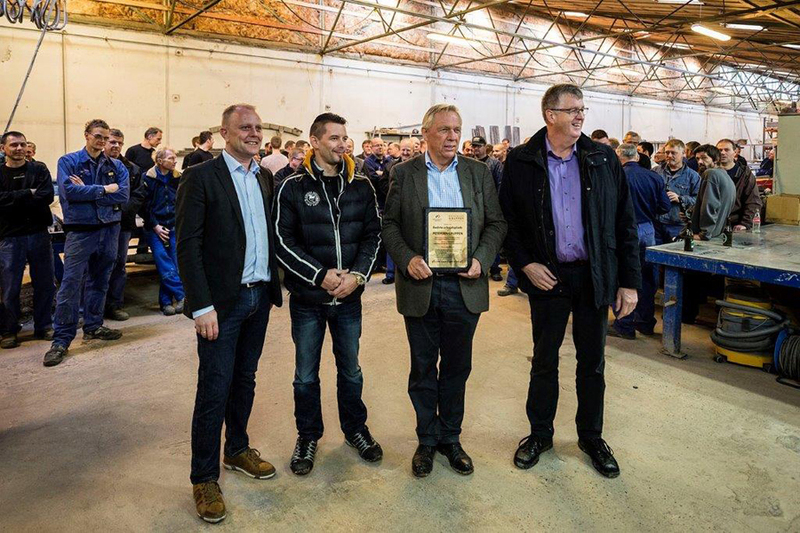 It was a very festive ceremony where the approximately 100 Petersen employees with Christian A. Petersen, his family and the brickworks’ other executives could welcome the honorable mention to the brickyard. After a touched Christian A. Petersen had thanked for the diploma, everybody was treated to roast suckling pig in one of the large production halls in the brickworks. The villa is expressive, modern, defined by clean lines and simple materials. 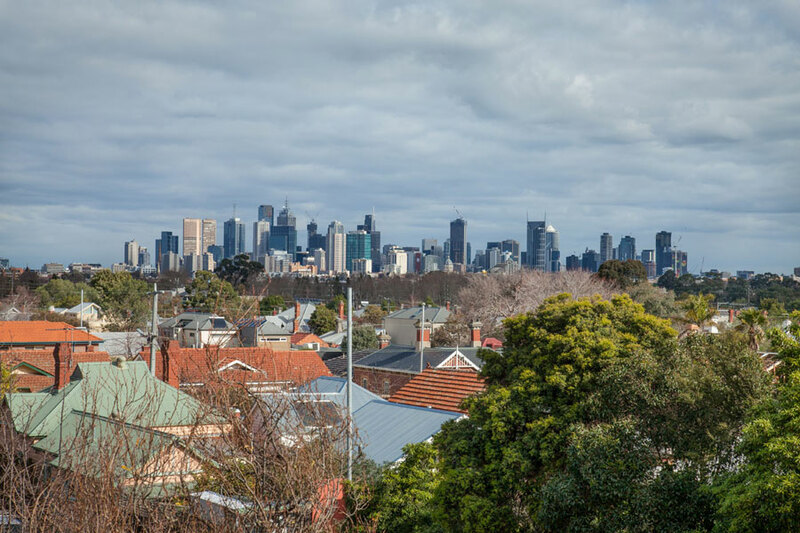 The Victoria suburb of South Yarra offers a fine view of the Melbourne skyline. The brick houses in the area stem from very different eras, but all have handmade and irregular façades, a feature they have in common with the new Kolumba home. At ground-floor level, the façade facing the garden consists of large windows with sliding doors that open onto the wooden-deck terrace. The first house in Australia built in Petersen bricks has now been completed, and the owners have moved in. It is a villa just outside Melbourne, designed by architect Robert Simeoni, and situated in South Yarra outside of Melbourne. The clients, Ian and Nicola Minchin, were undecided regarding which cladding to chose for their new home when their friend, Peter Robertson, showed them a photo of K55 which was about to arrive in Australia. The choice was easy to make then. Peter Robertson has a long history with bricks and is now the Australian distributor for Petersen Brick from Denmark. Architecture is not merely about beautiful buildings and eye-catching structures. Architecture is about creating settings for people's lives and experiences: settings for the current of light, energy, substance and people, who are the very pulse of life. This is the fundamental contention made by the Danish writer, Tor Nørretranders, who has curated The Heart of the Stone, Danish Architecture Centre's major summer exhibition, which looks at the work of the internationally renowned Danish architecture practice, Lundgaard & Tranberg. 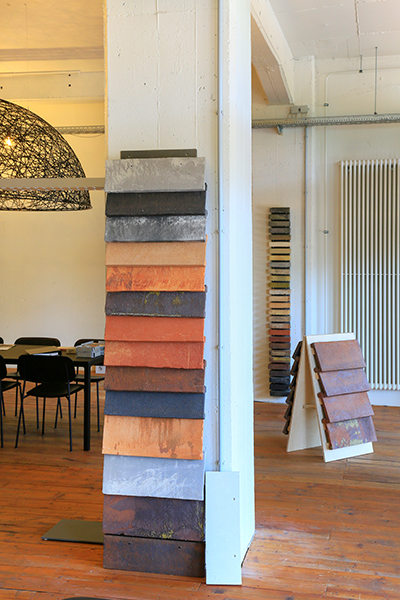 Throughout their entire production Lundgaard & Tranberg have used bricks from Petersen Tegl. And the exhibition at DAC contains specimens of walls from the Royal Playhouse and Charlottehaven in Copenhagen. The Heart of the Stone is open until 21 September this year.